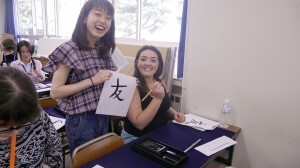 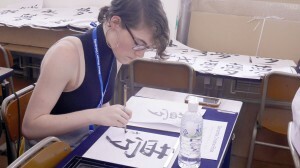 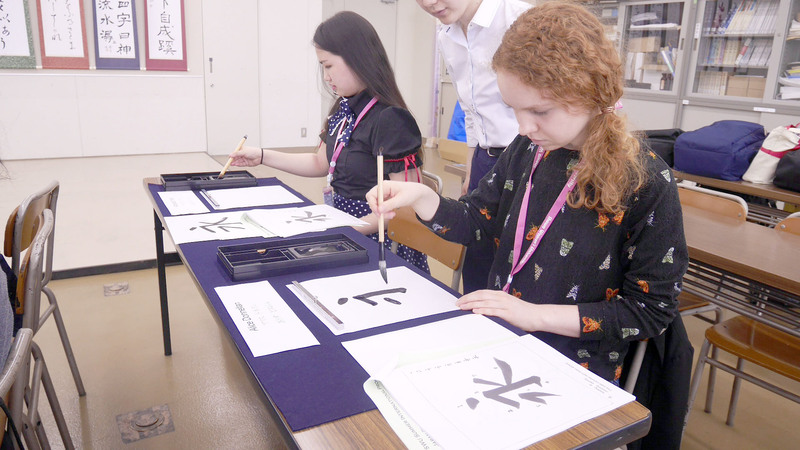 On this cloudy day students were able to enjoy learning Japanese calligraphy in the morning and hearing about Japanese food culture in the afternoon. 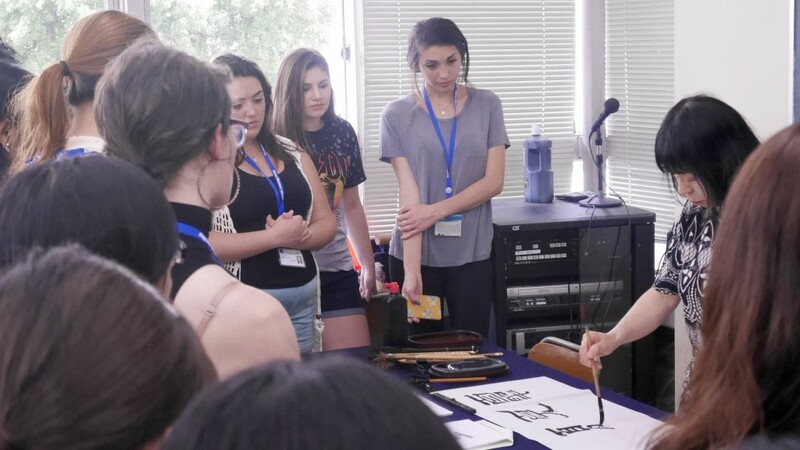 In the morning, Showa’s Utsugita-sensei (Yoshie Utsugita) gave a brief introduction on the history of calligraphy and its different styles in Japan. 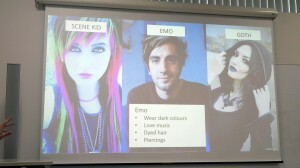 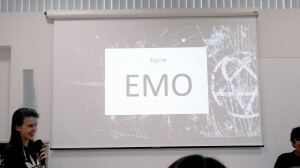 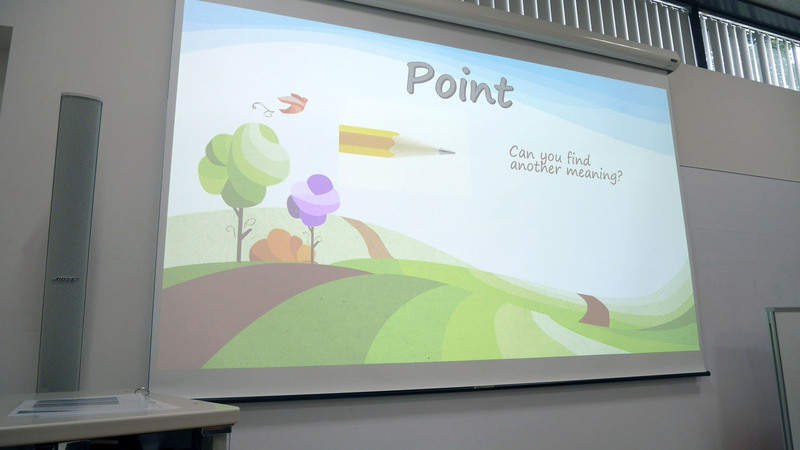 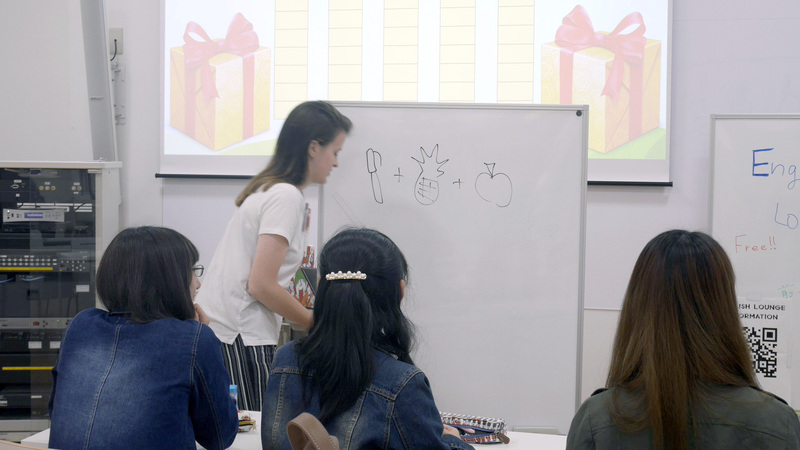 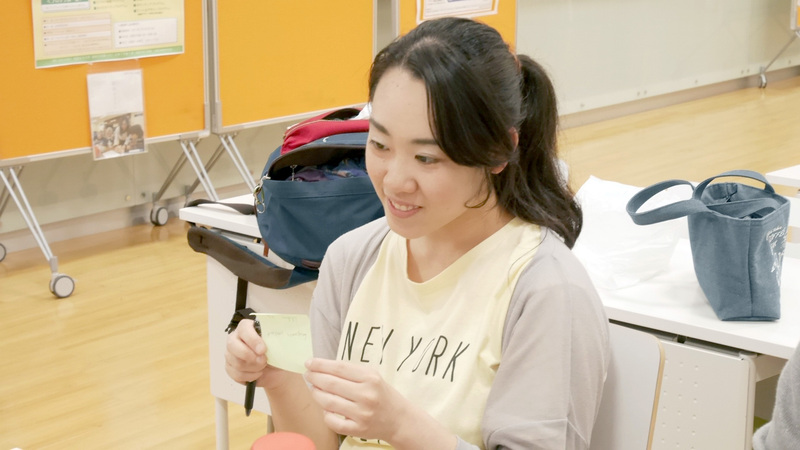 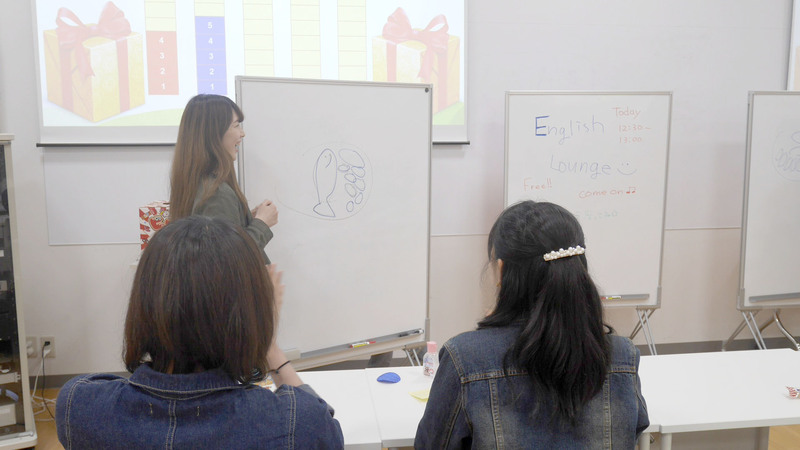 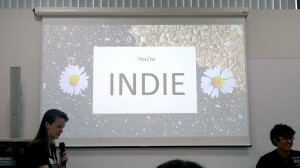 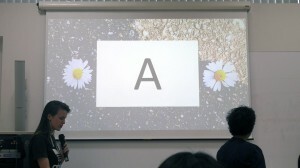 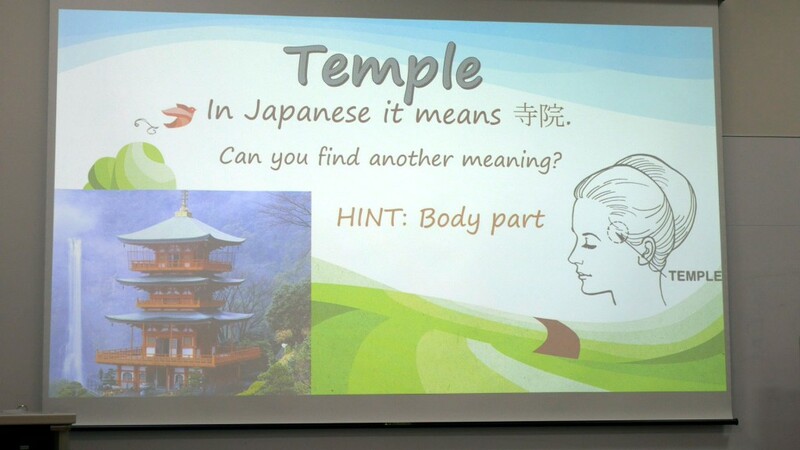 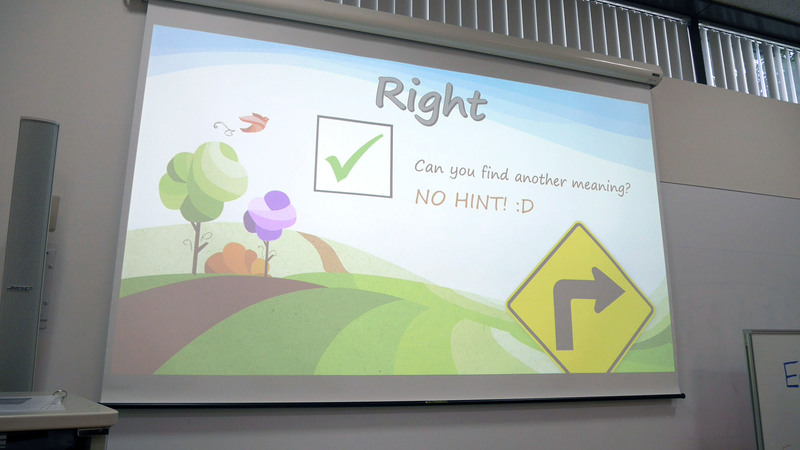 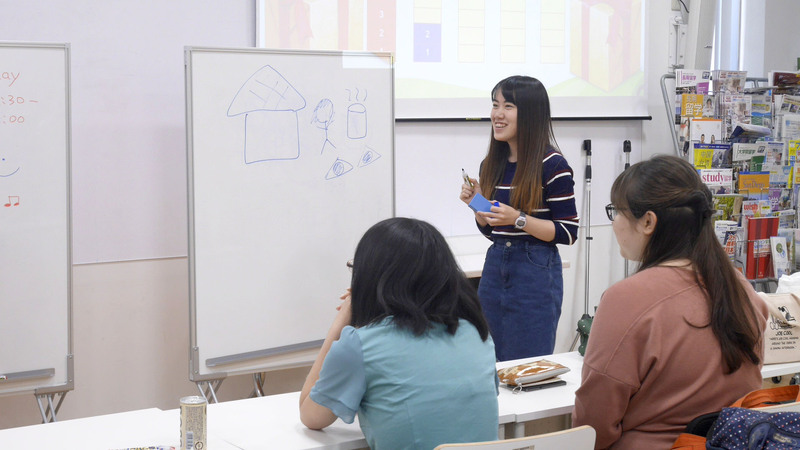 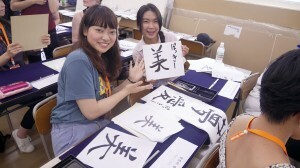 She then proceeded to demonstrate how to write the character 「夏」(natsu; summer) in various styles, as well as demonstrating the basic character 「永」(ei; eternity). 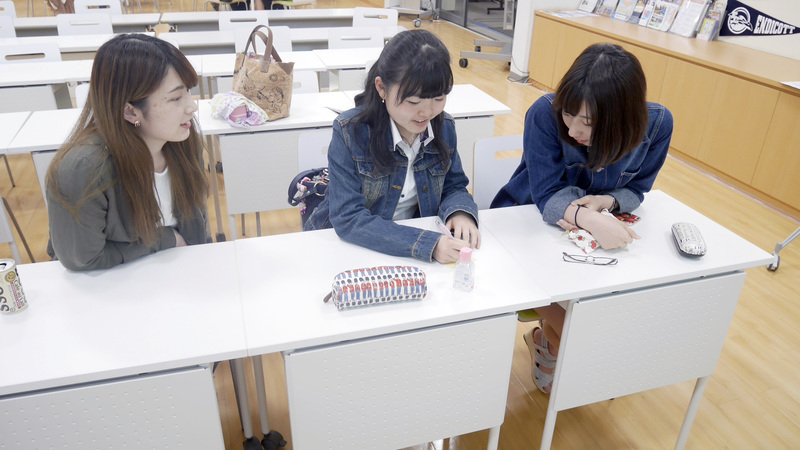 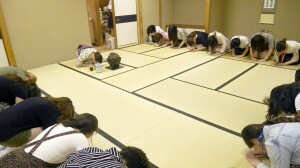 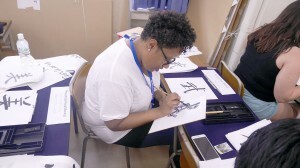 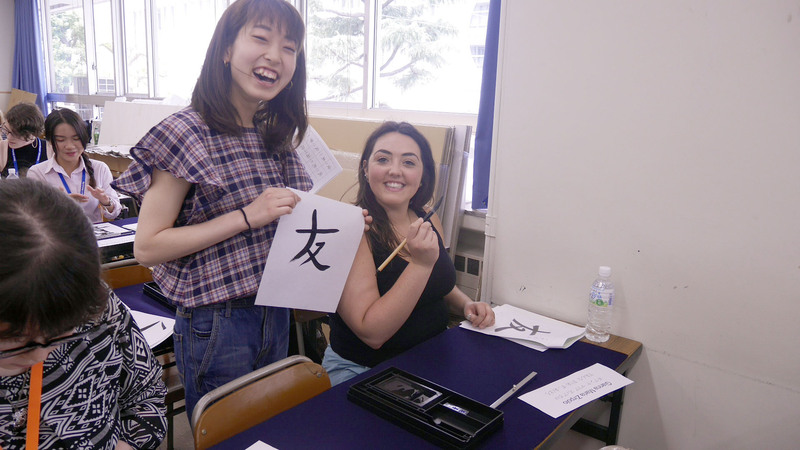 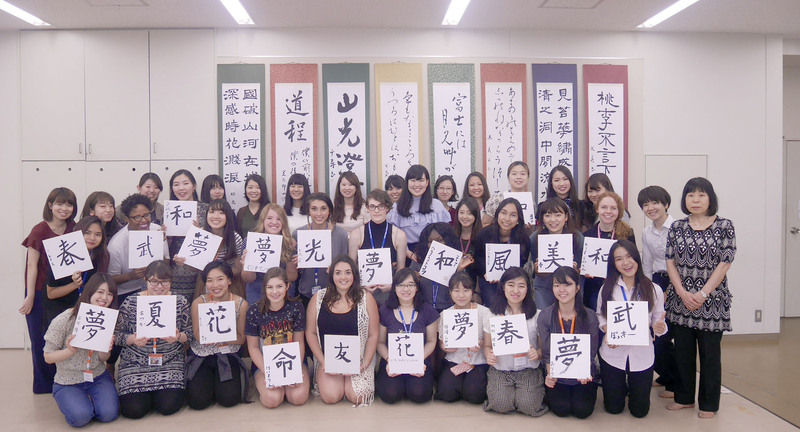 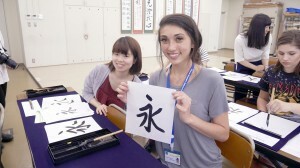 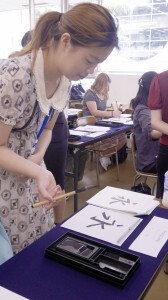 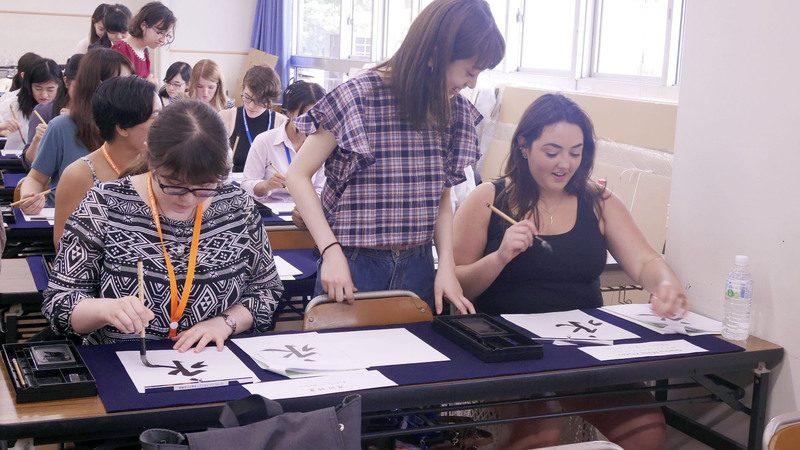 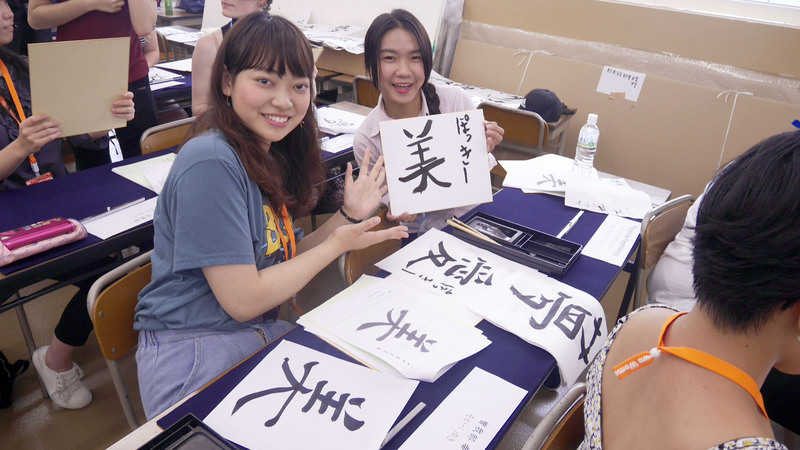 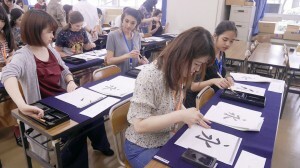 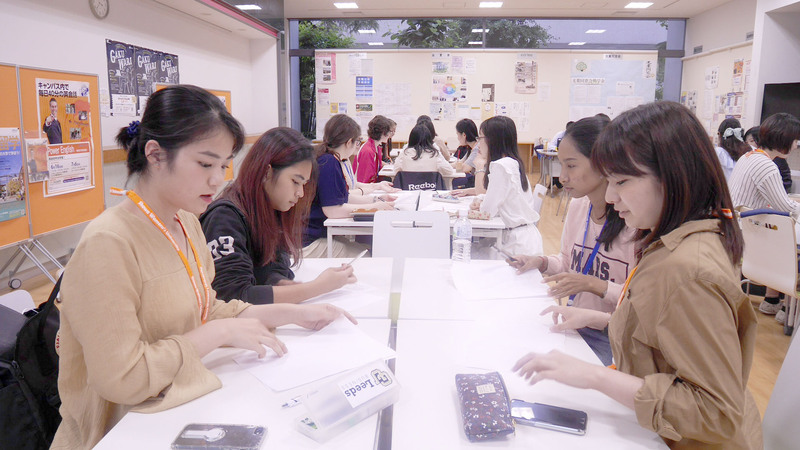 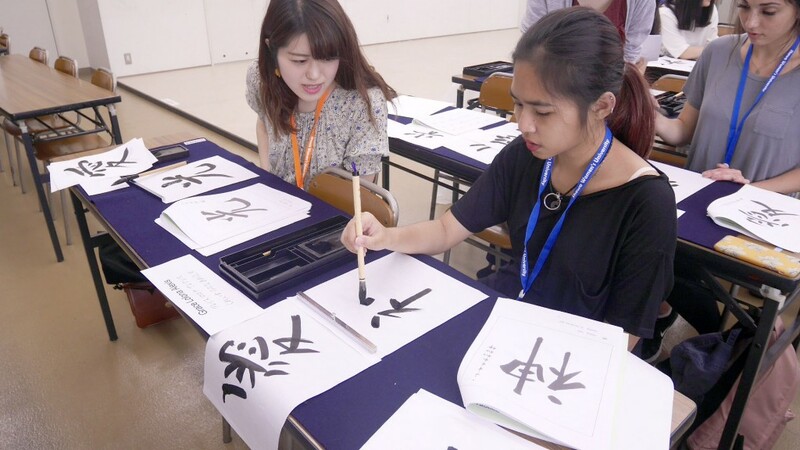 Students then began practicing Japanese calligraphy themselves, assisted by the Showa calligraphy club. At the end, everyone took a group photo with their polished finished pieces. 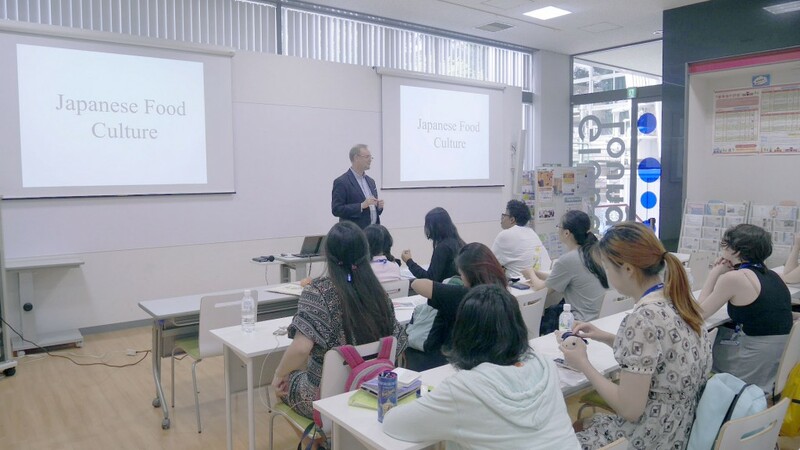 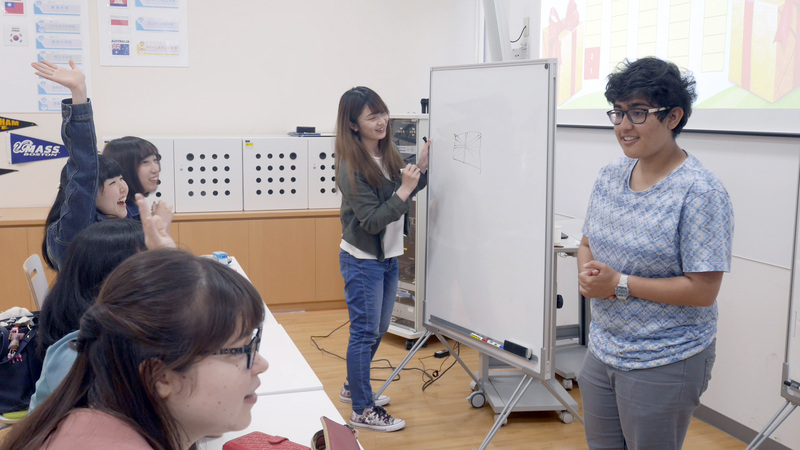 After a quick lunch break, all the students came together to attend a lecture led by Ash-sensei on Japanese food culture. 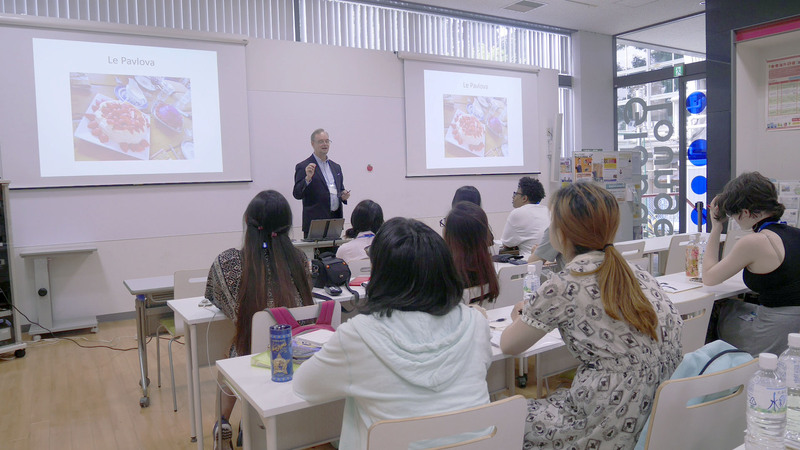 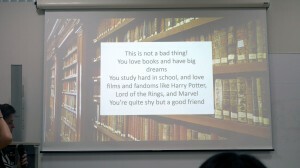 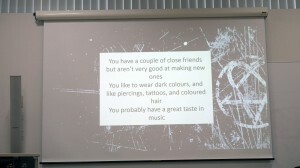 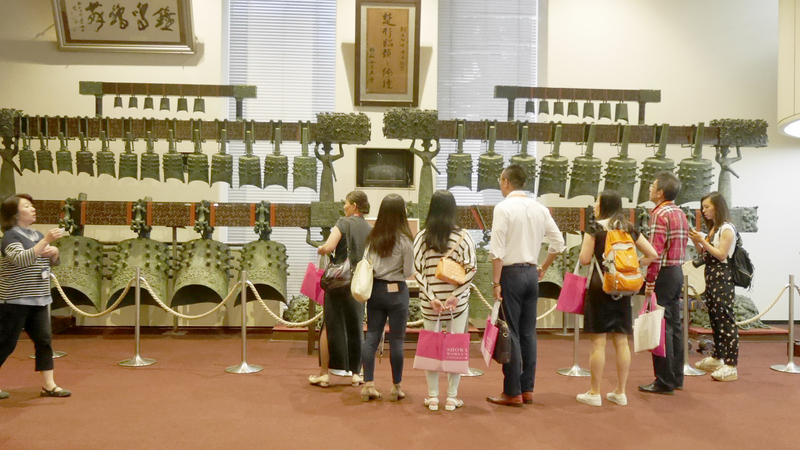 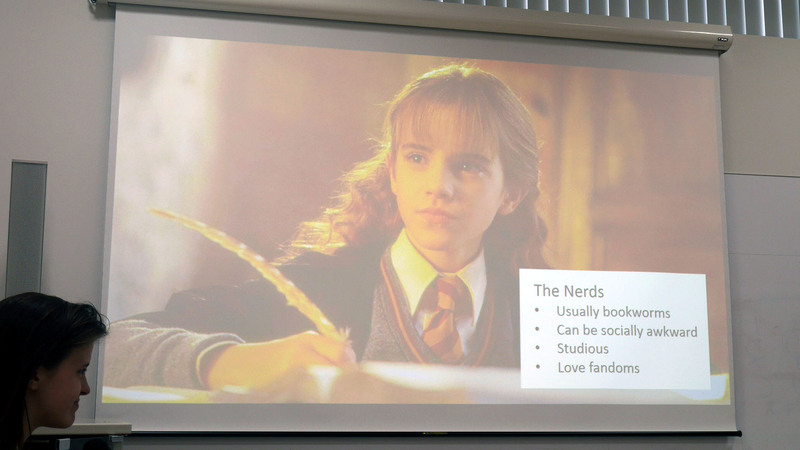 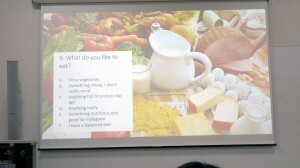 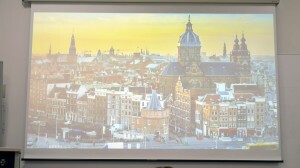 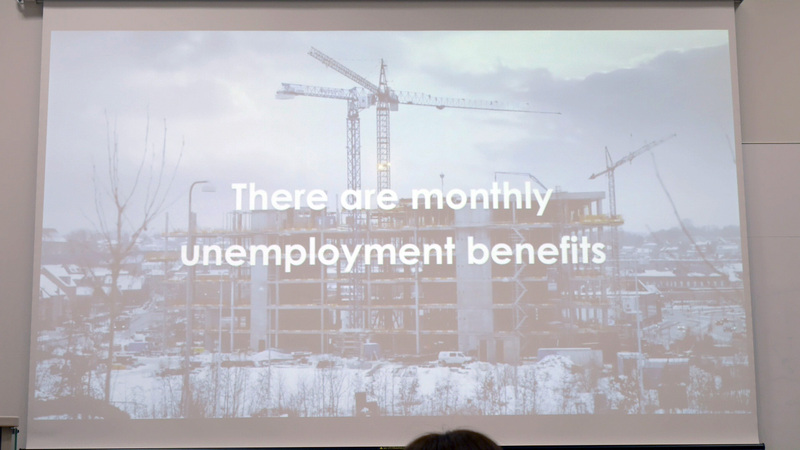 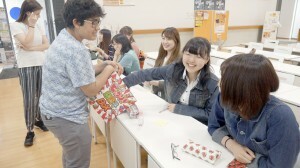 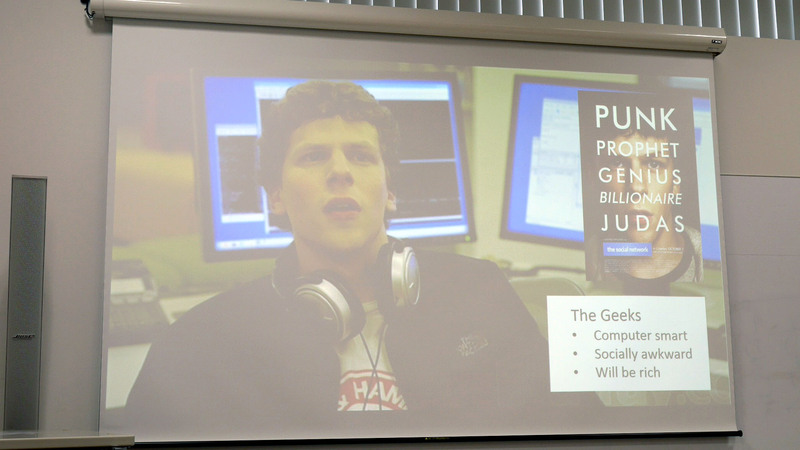 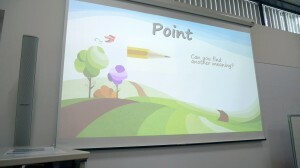 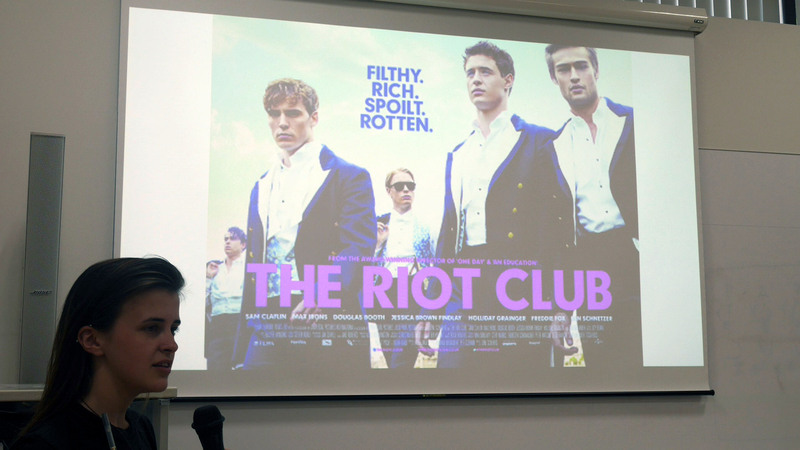 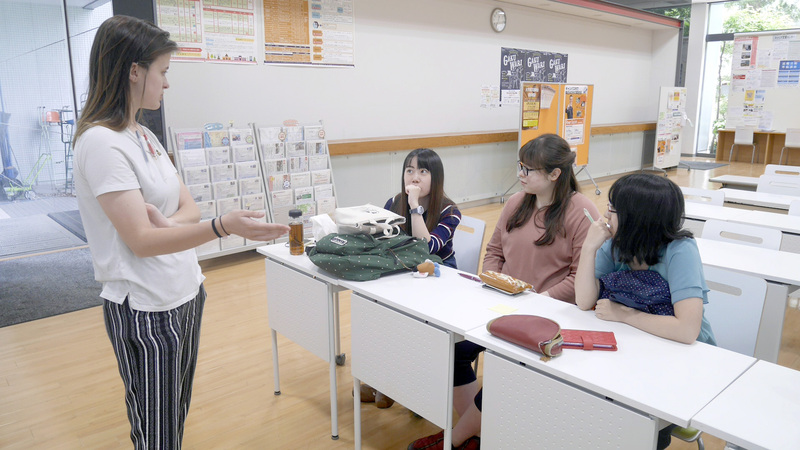 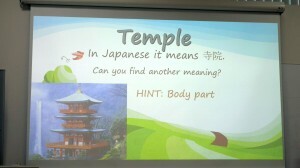 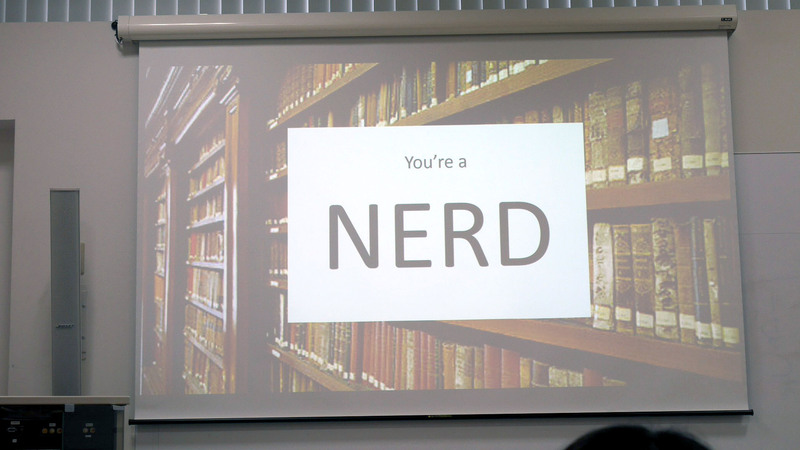 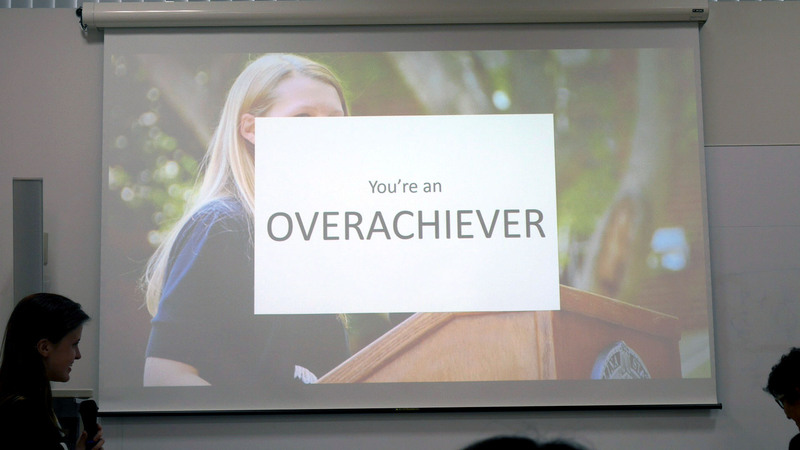 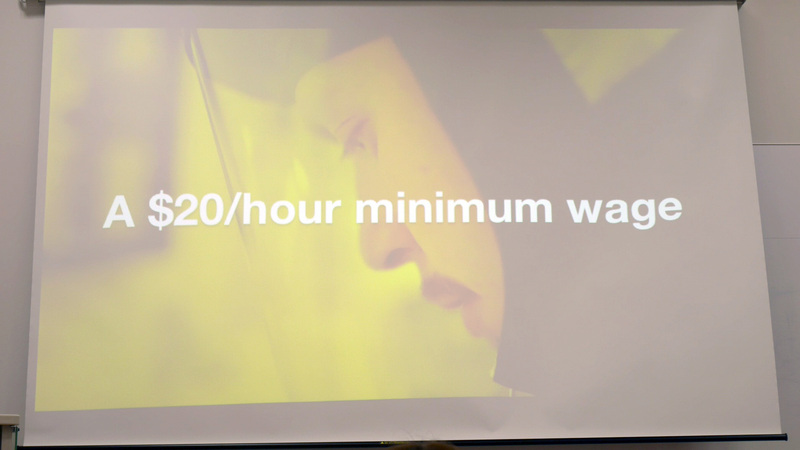 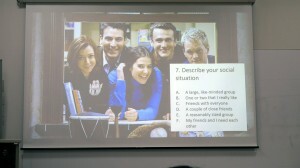 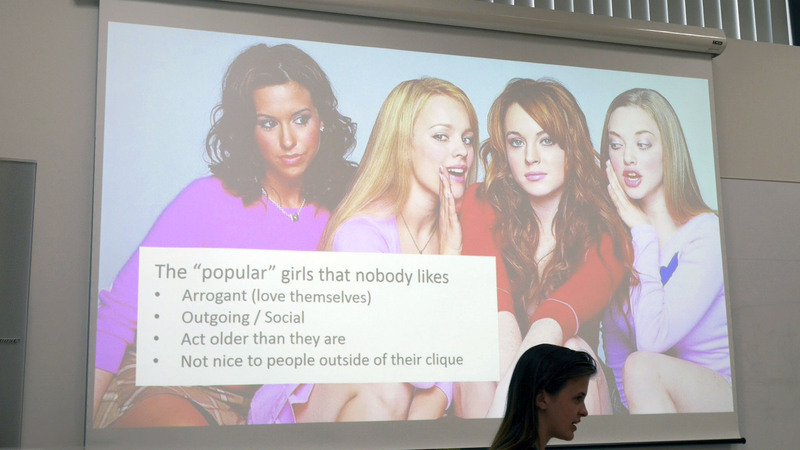 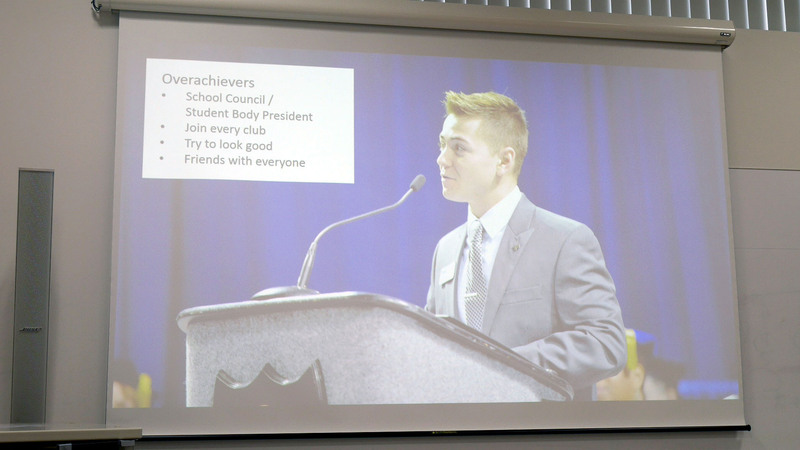 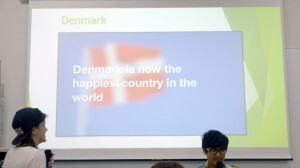 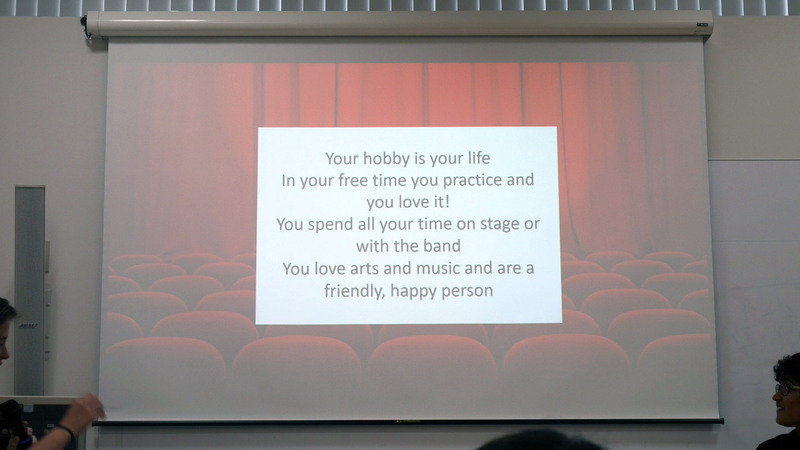 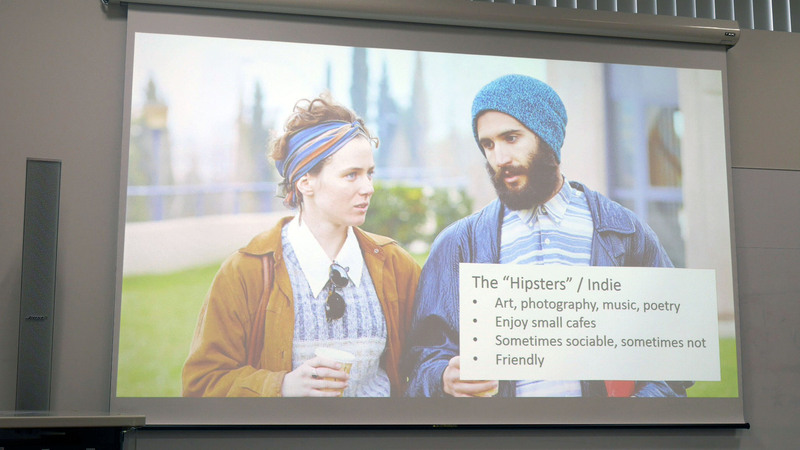 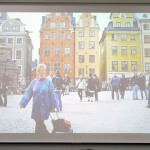 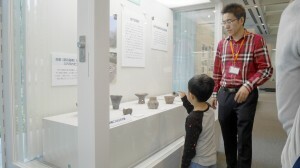 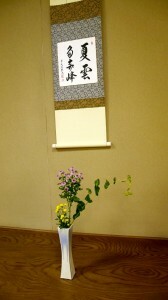 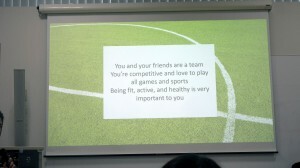 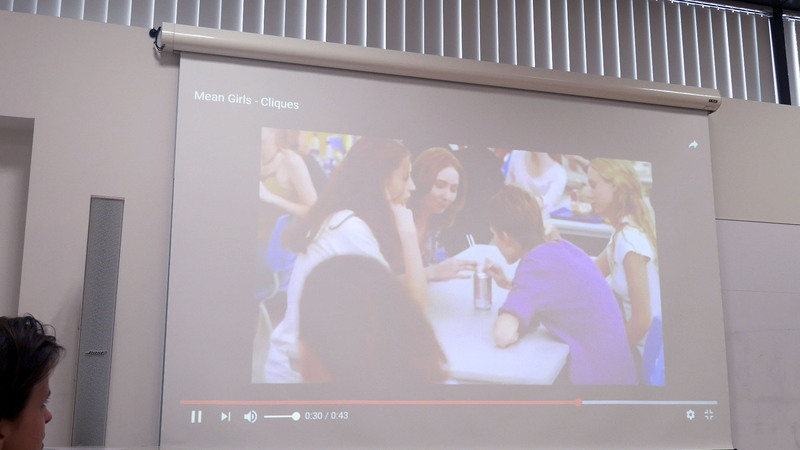 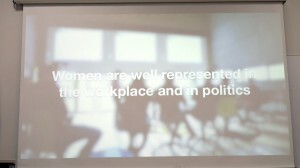 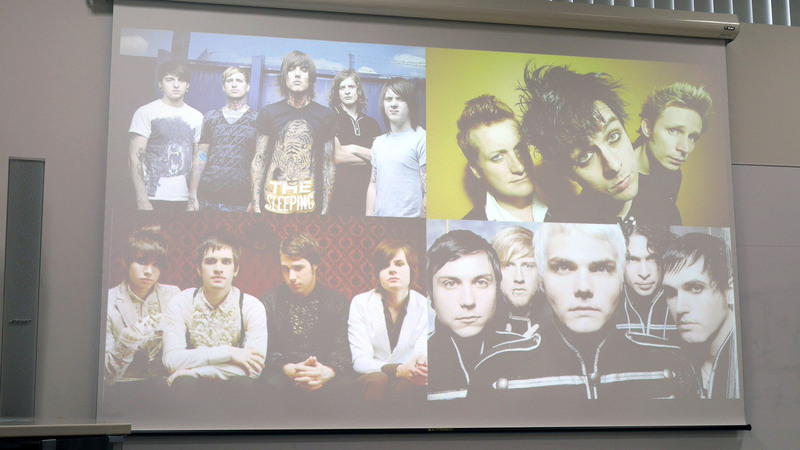 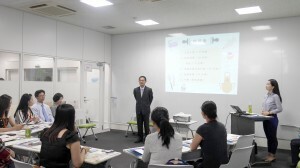 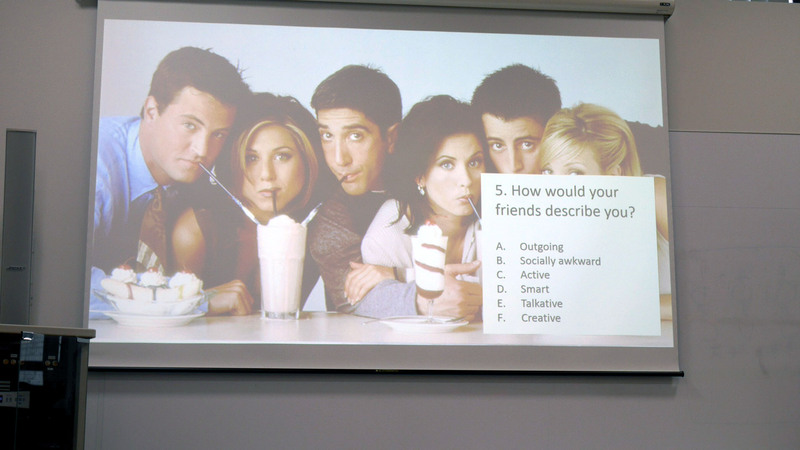 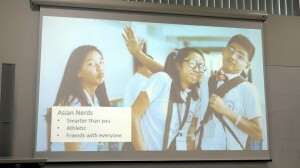 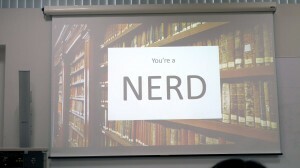 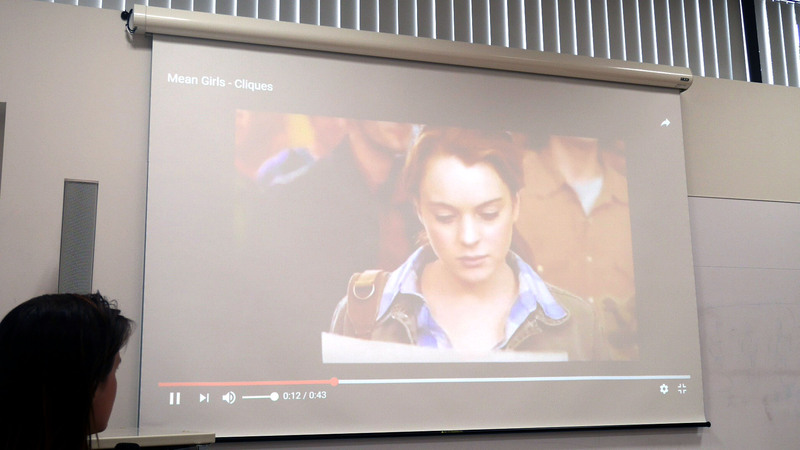 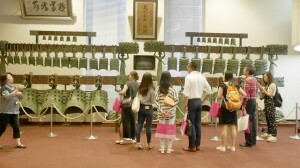 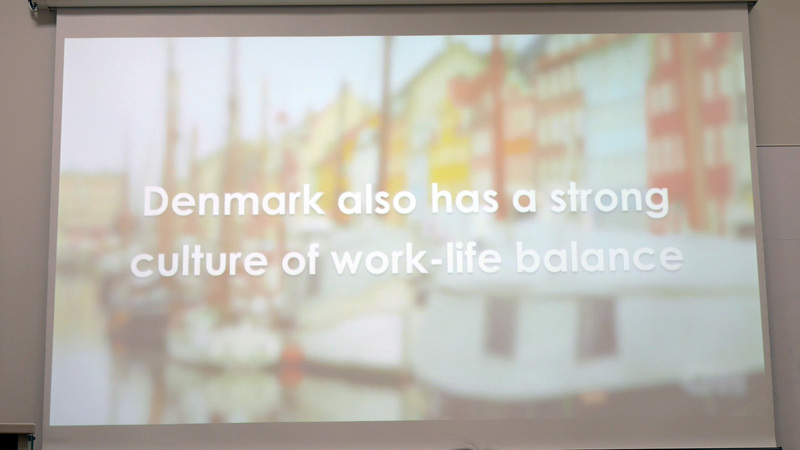 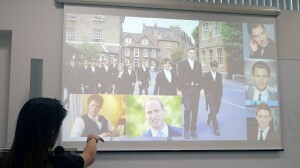 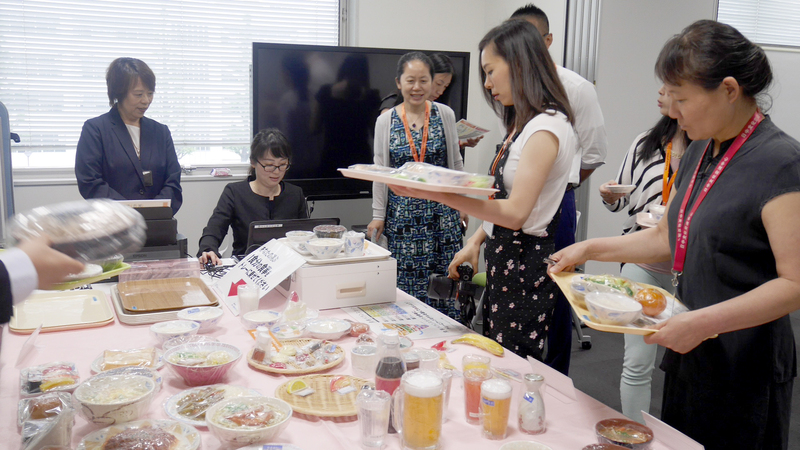 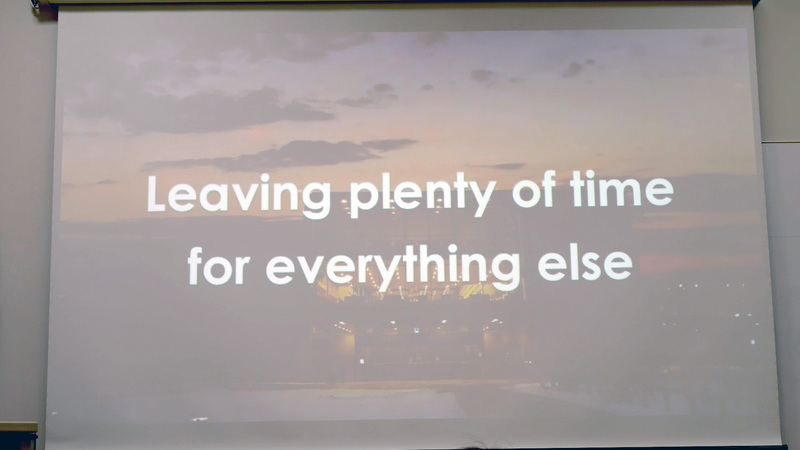 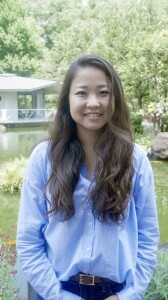 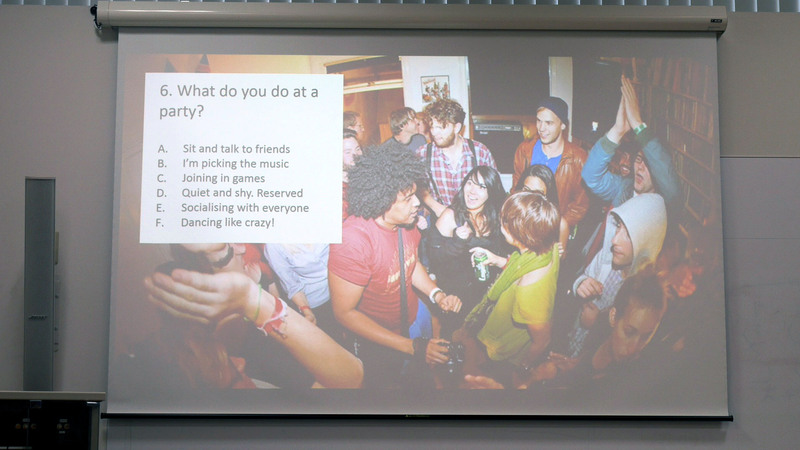 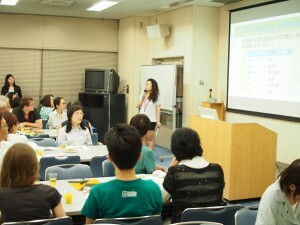 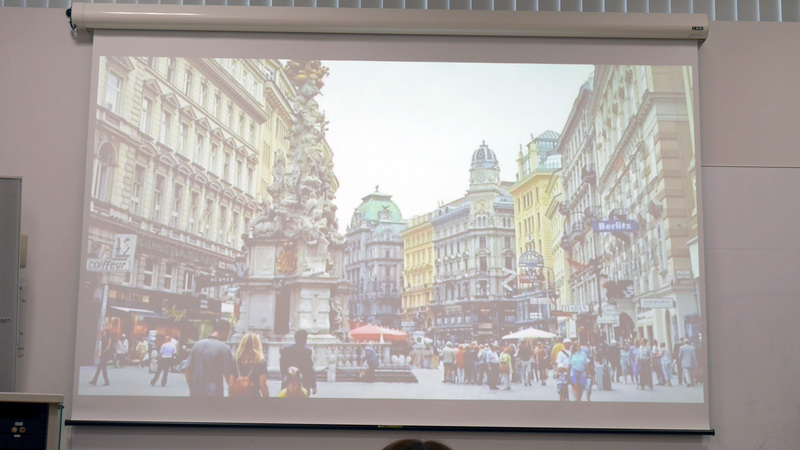 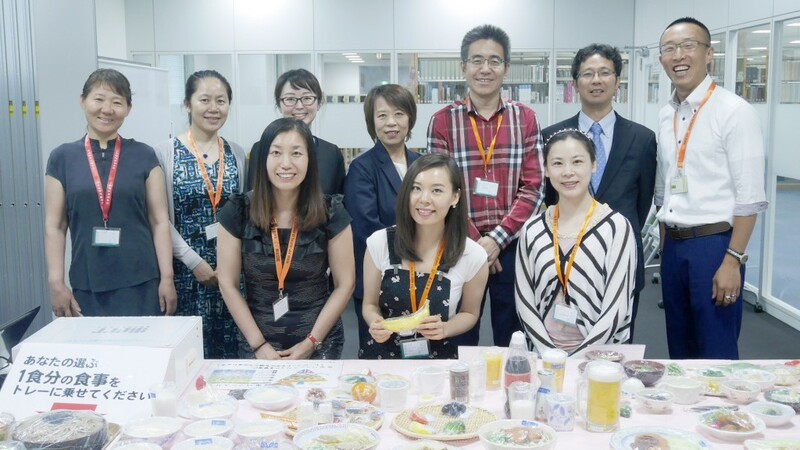 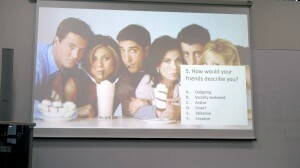 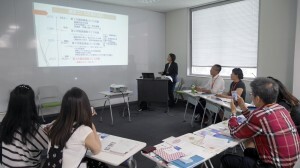 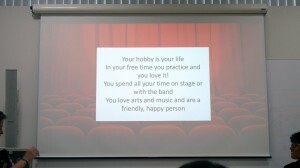 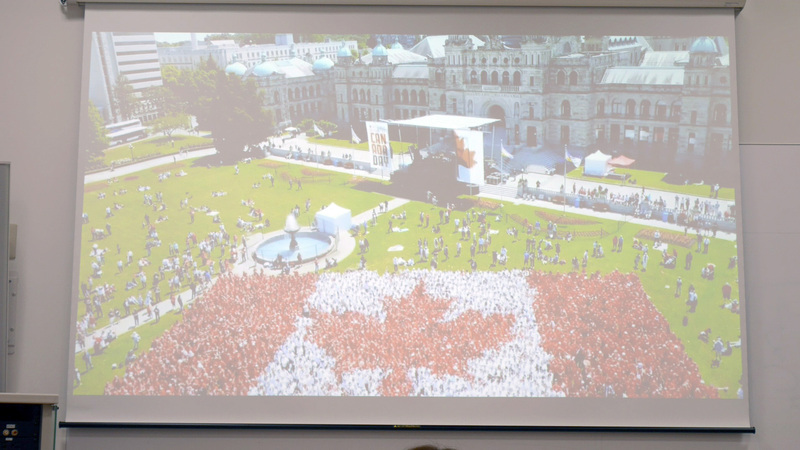 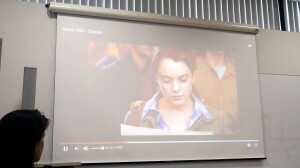 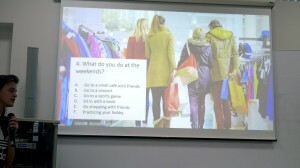 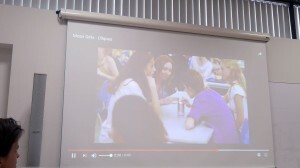 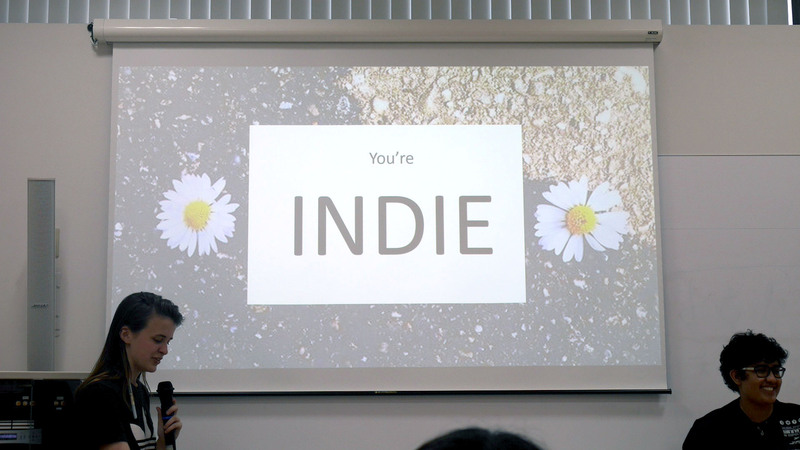 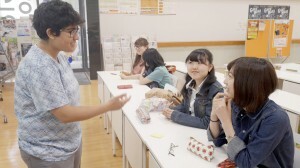 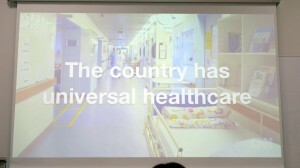 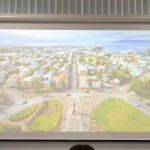 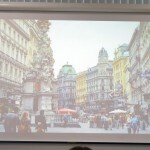 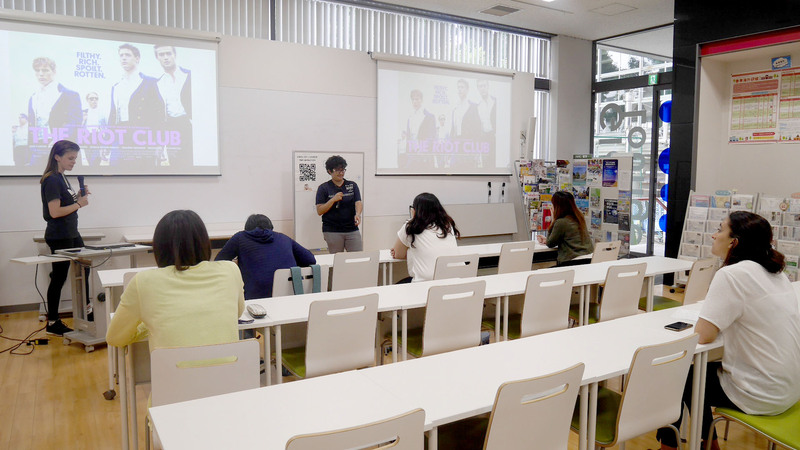 He presented on topics such as Japanese alcohol, sushi, and bentos (box lunches). 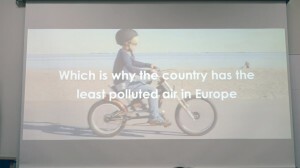 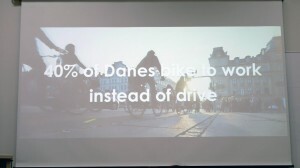 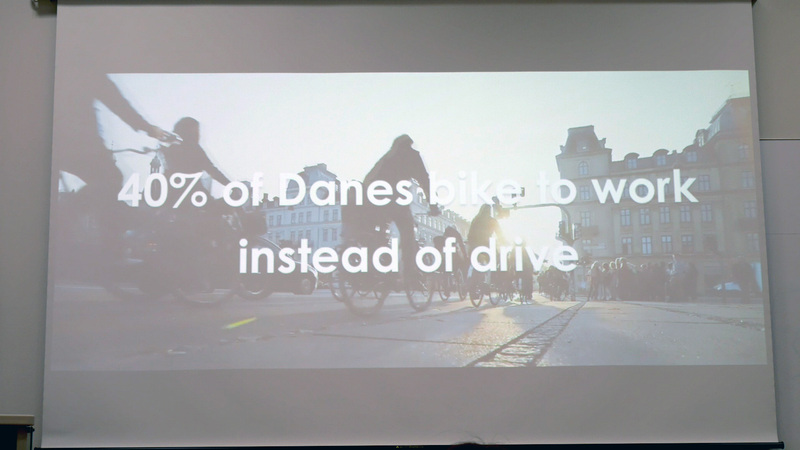 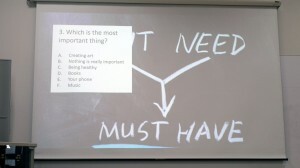 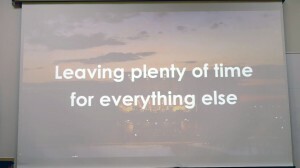 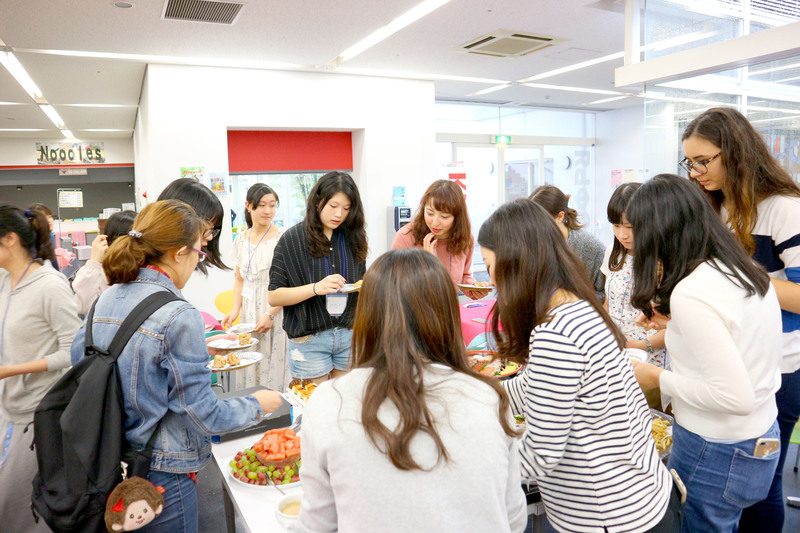 It’s a good thing that everyone was able to have lunch first, or surely they would’ve gotten hungry because of the lecture! 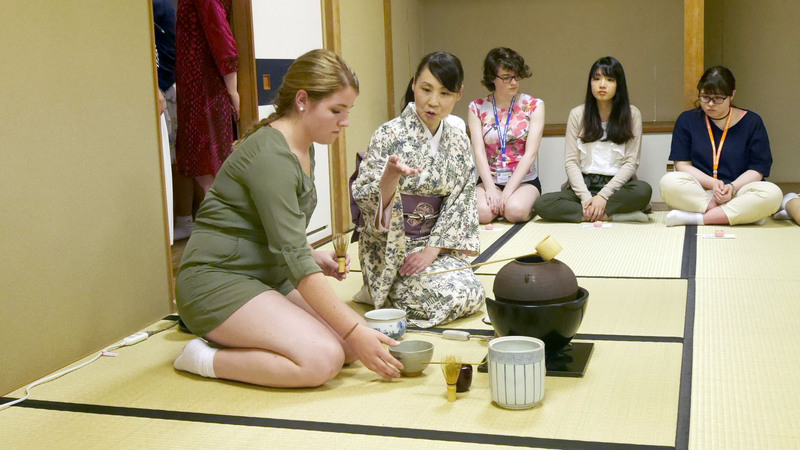 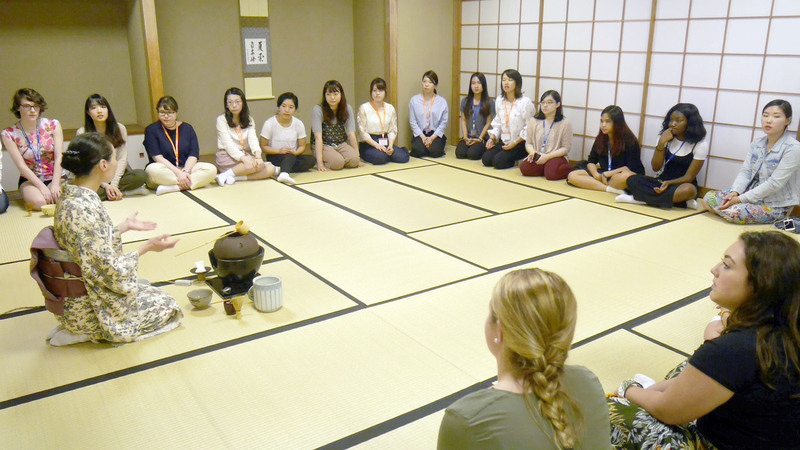 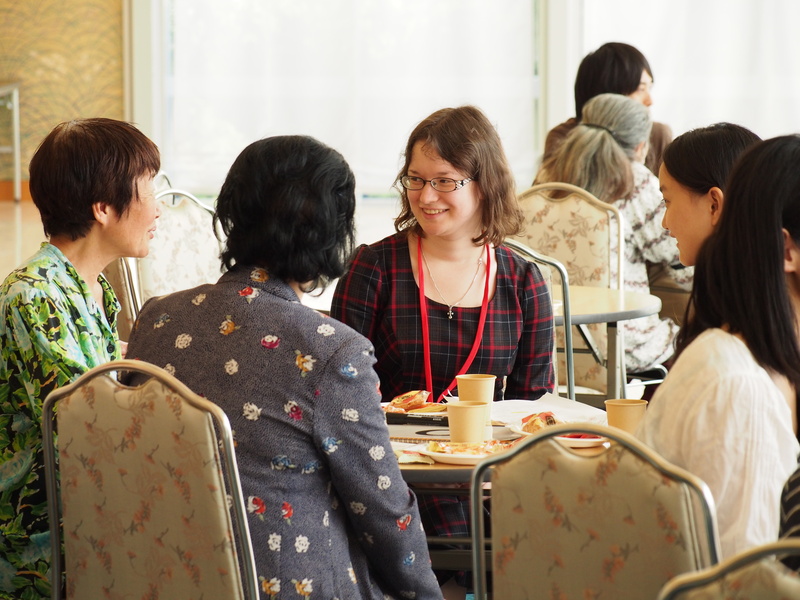 During the tea ceremony activity, CIE’s Ash-sensei (Ashley Warren) gave a brief lecture on the history and meaning of Japanese tea ceremony, after which Ito-sensei (Eiko Ito) demonstrated a gorgeous traditional tea ceremony. 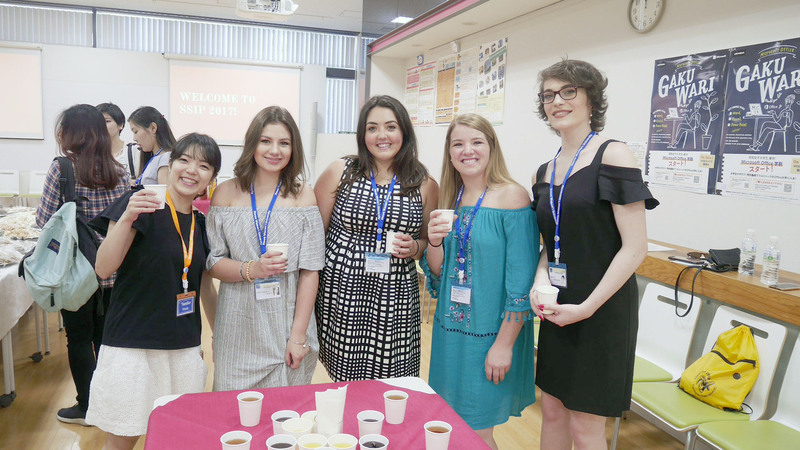 The students then had a chance to sample some traditional Japanese sweets, drink the tea, and try their own hand at tea ceremony. 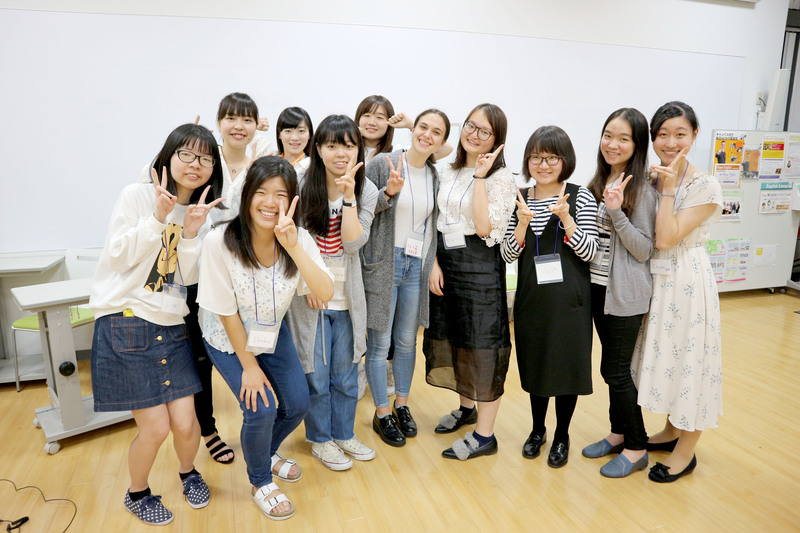 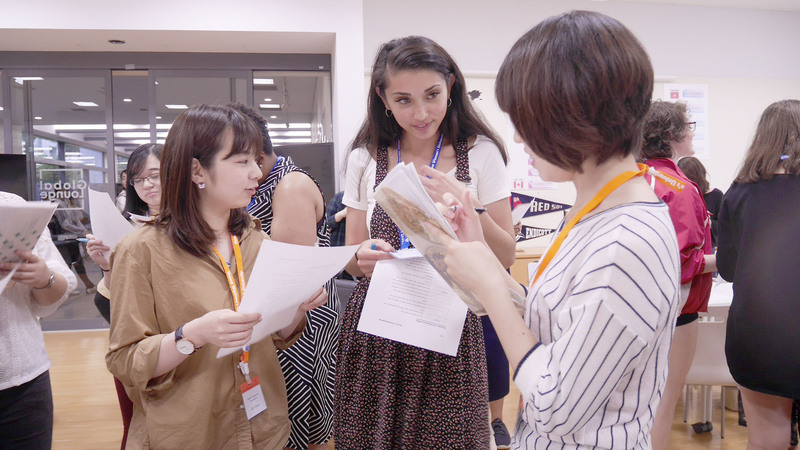 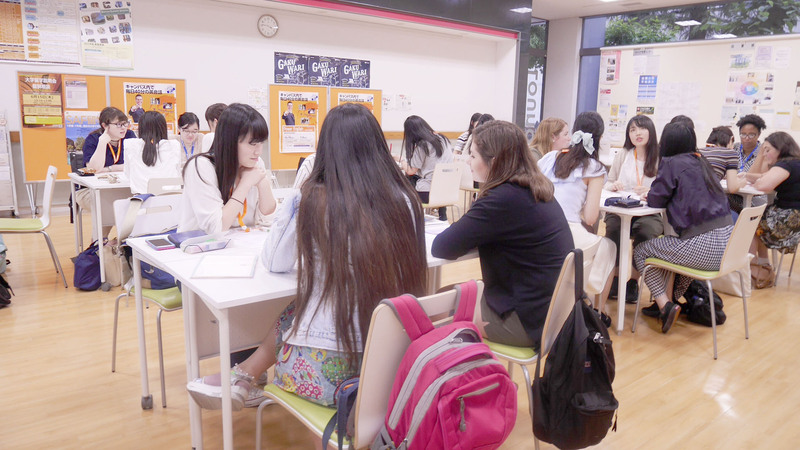 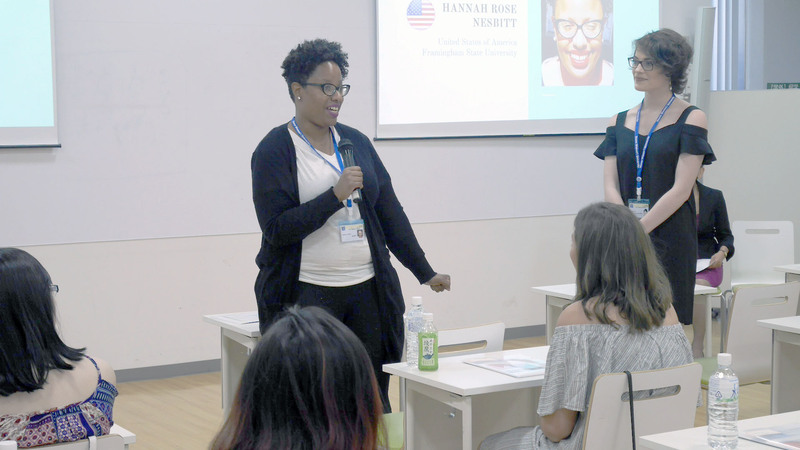 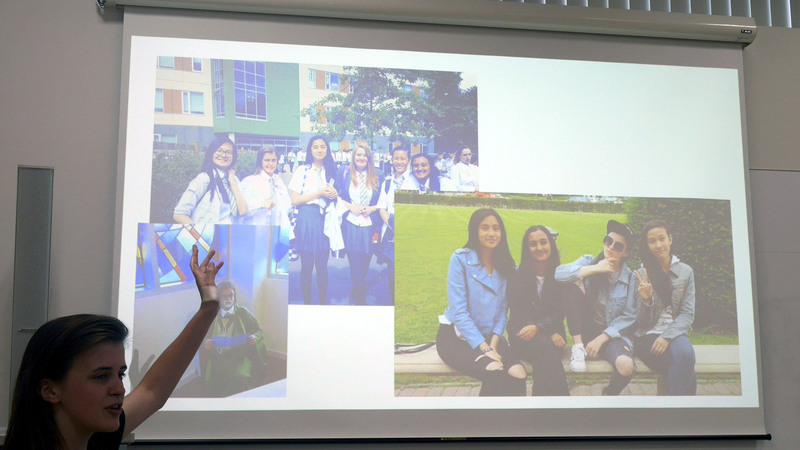 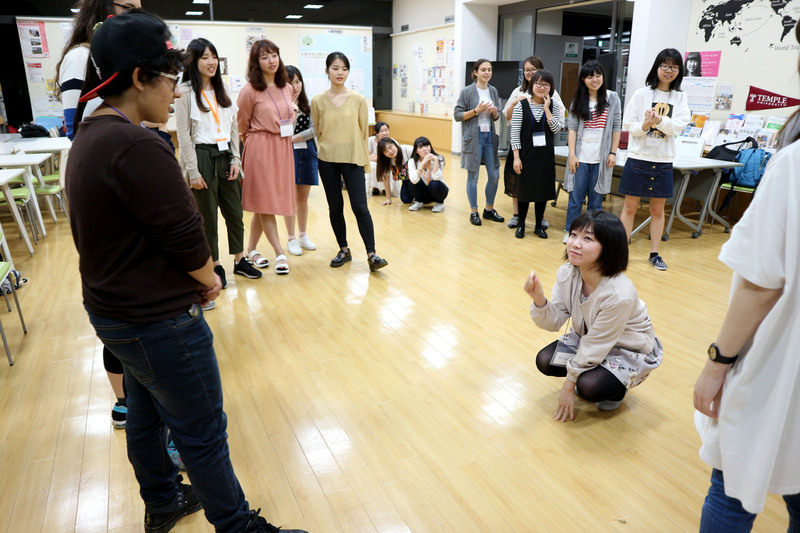 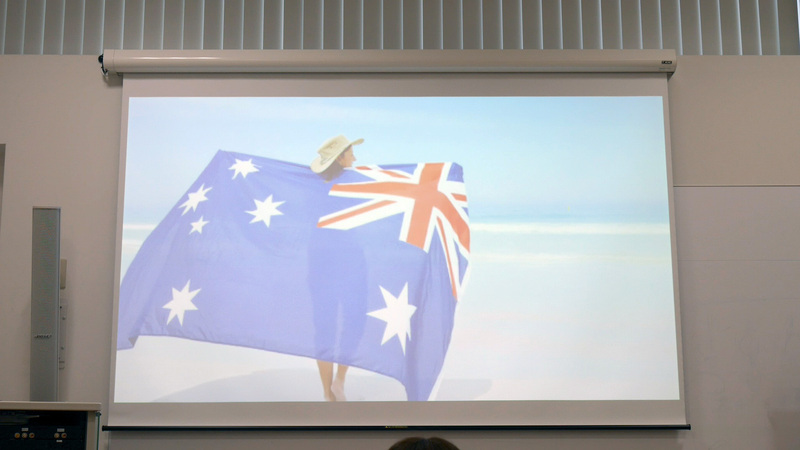 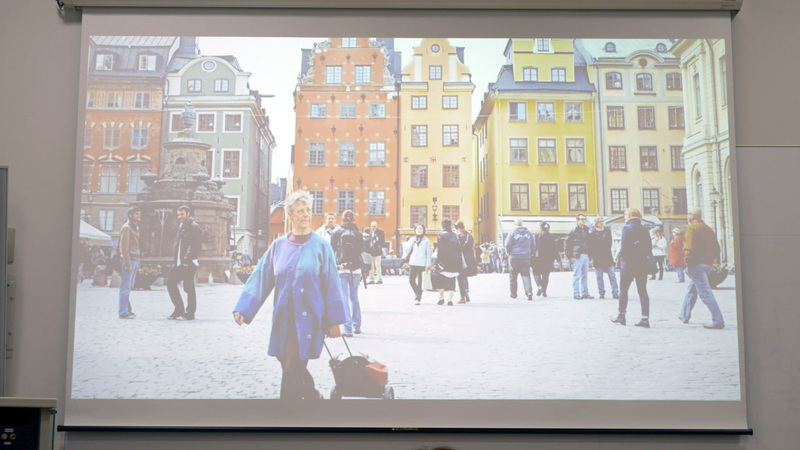 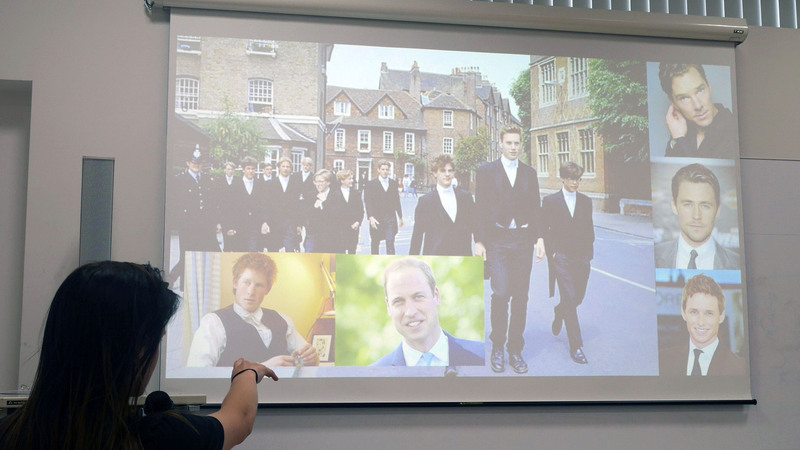 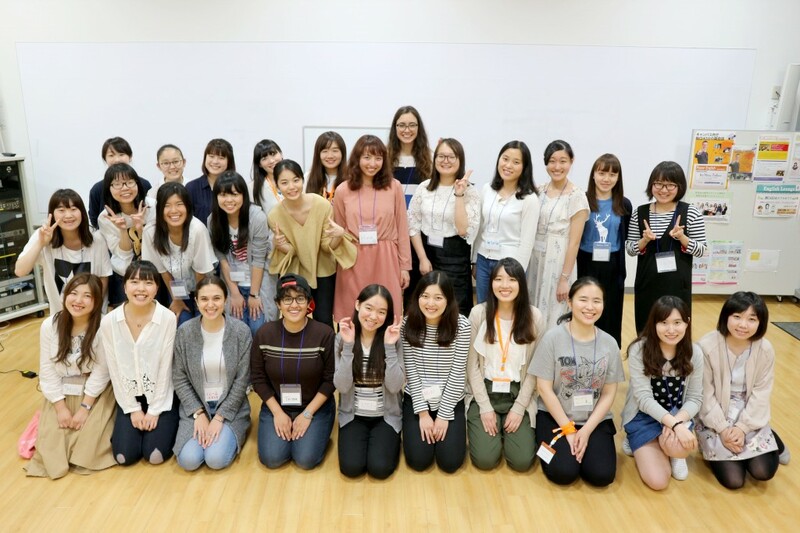 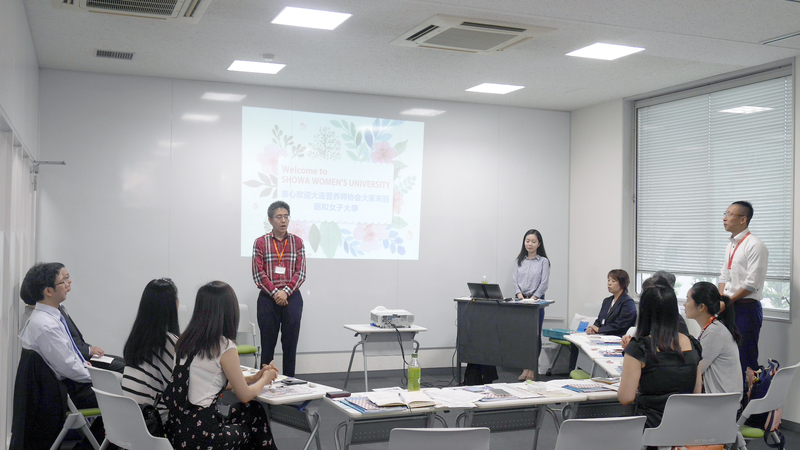 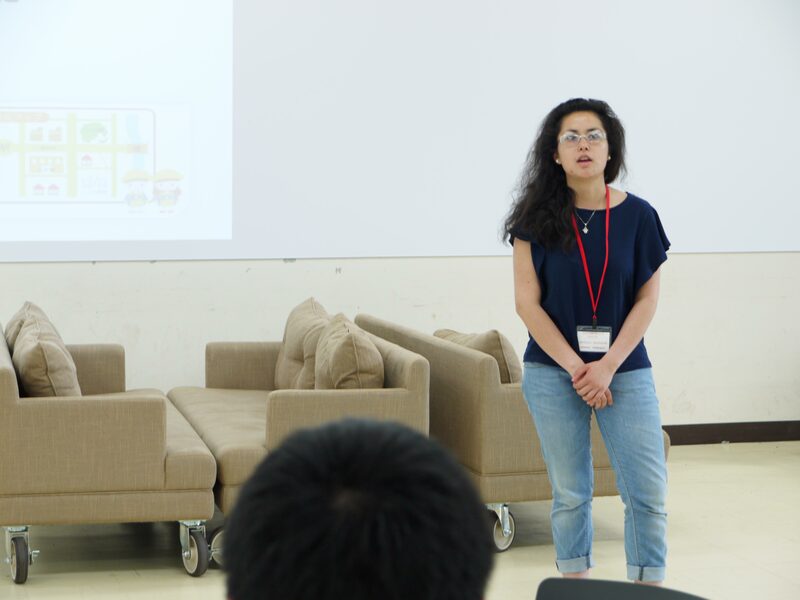 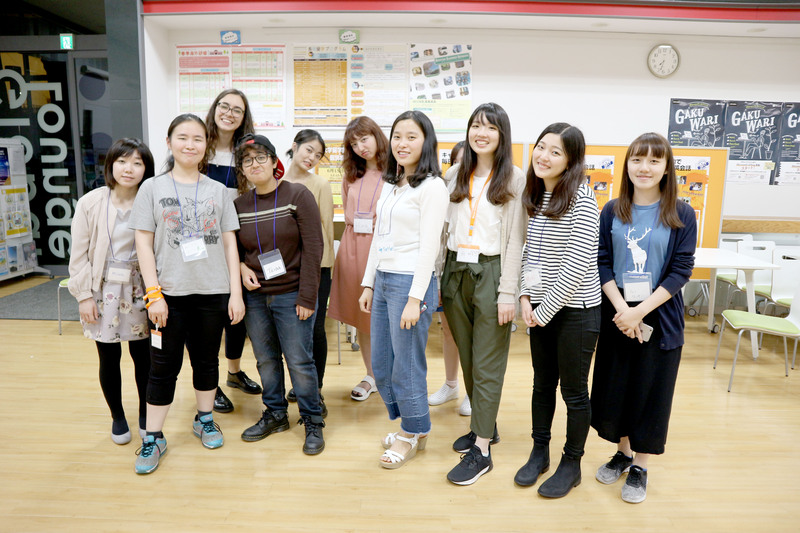 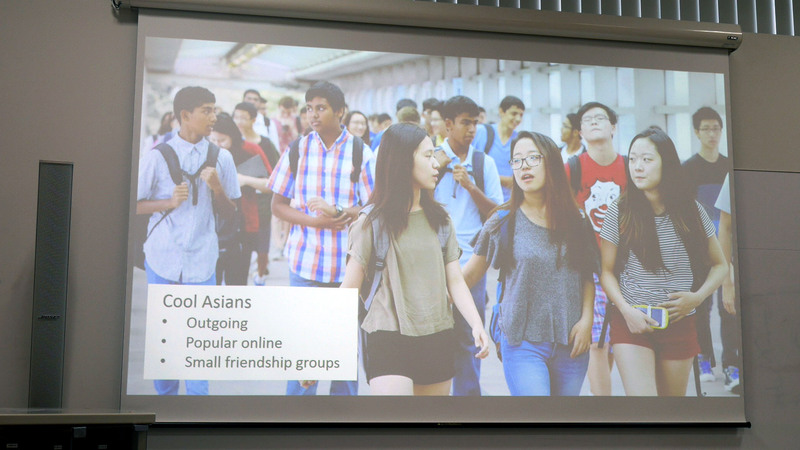 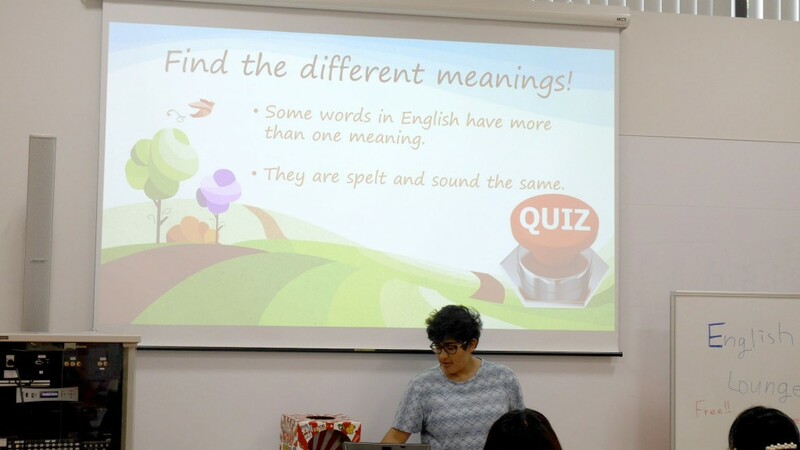 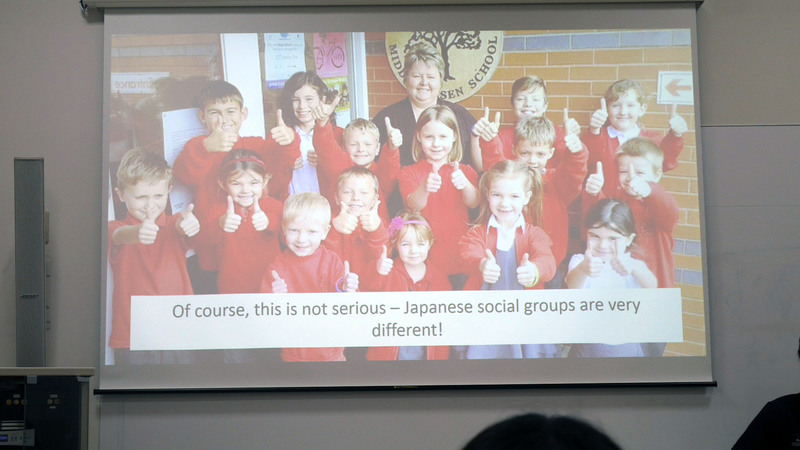 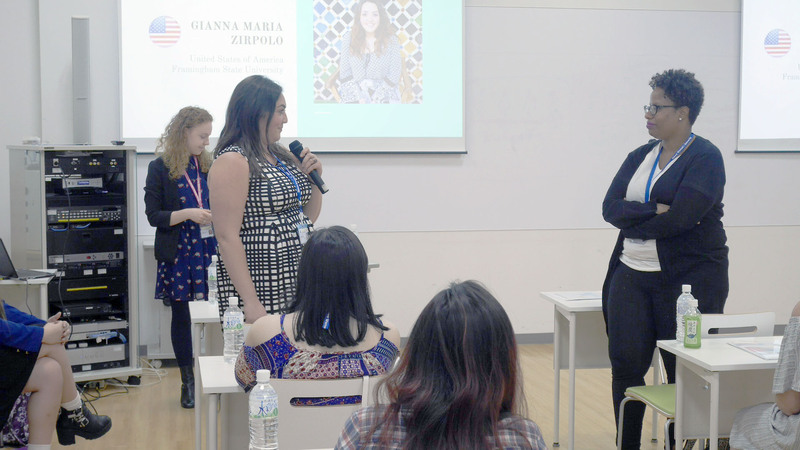 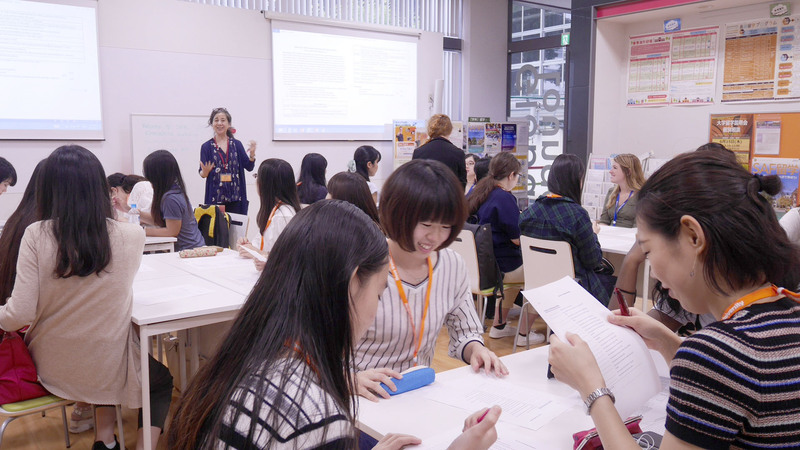 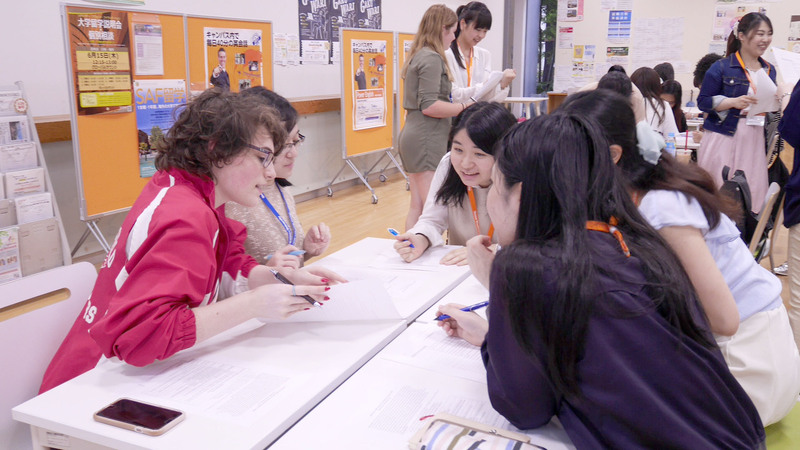 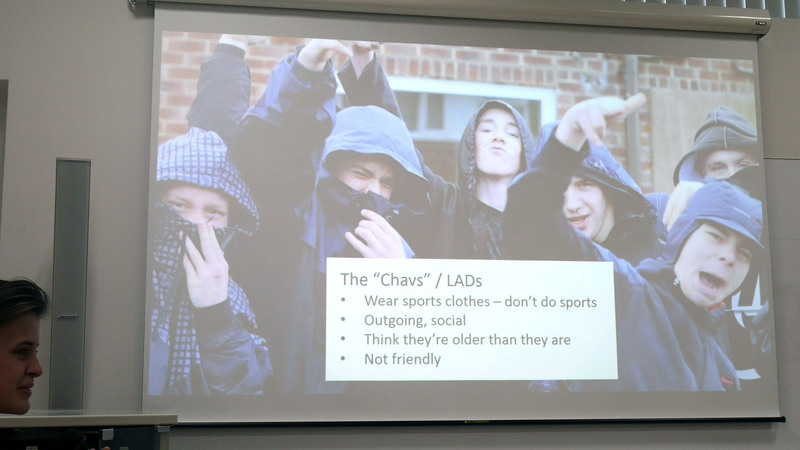 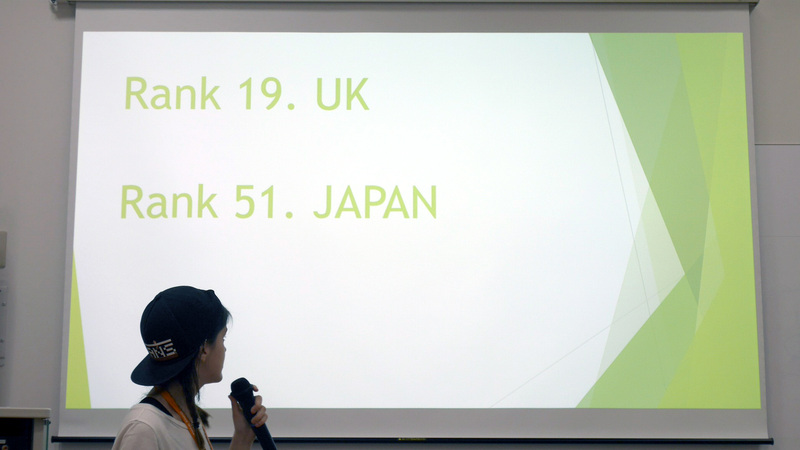 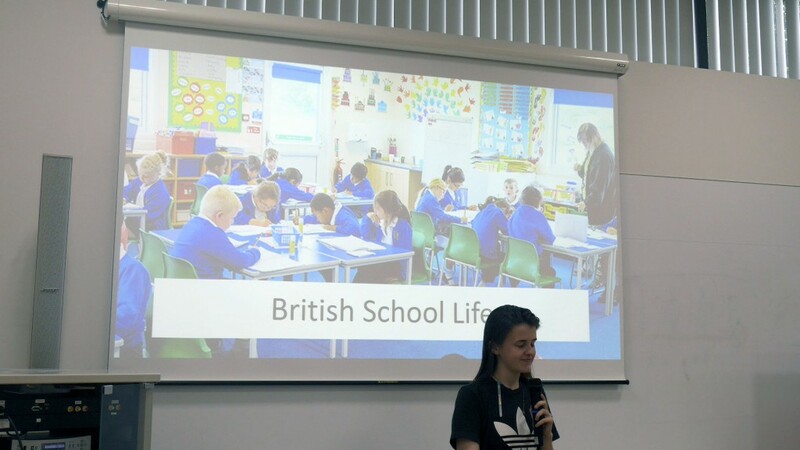 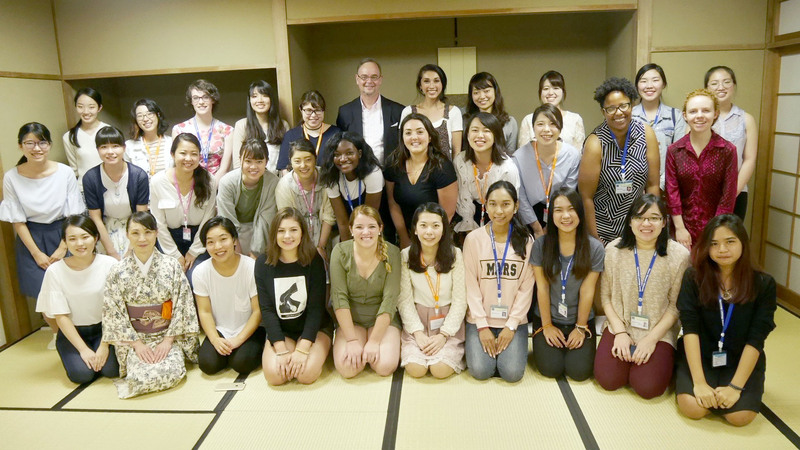 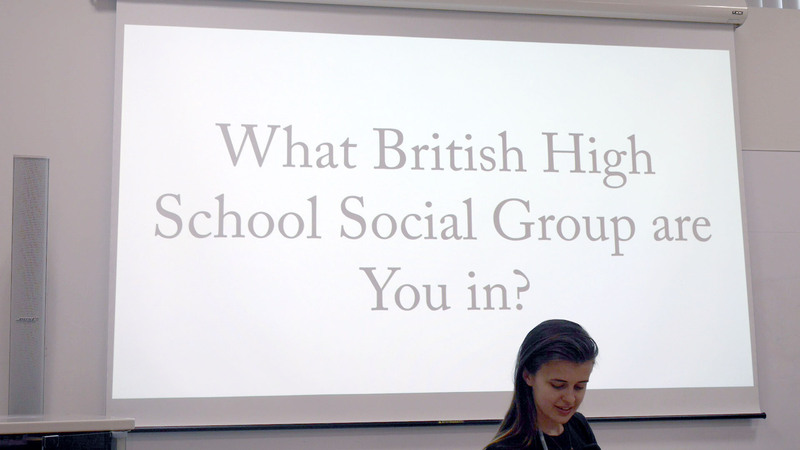 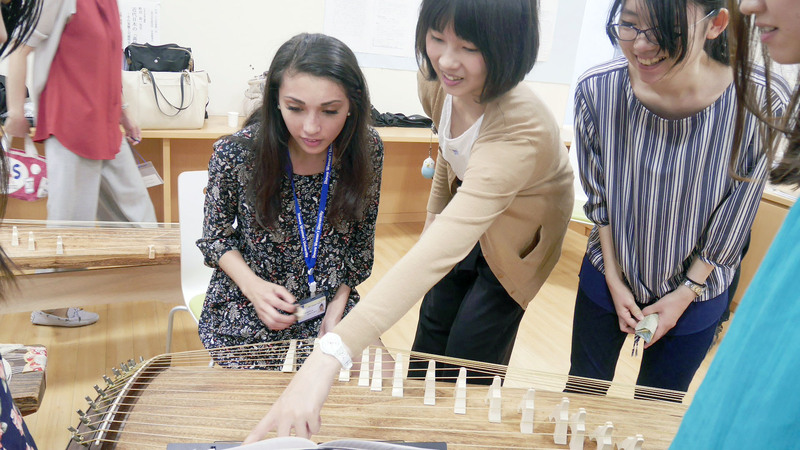 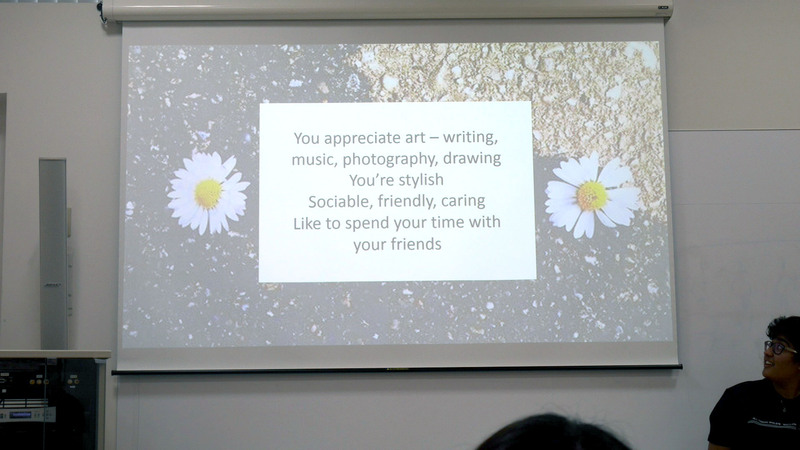 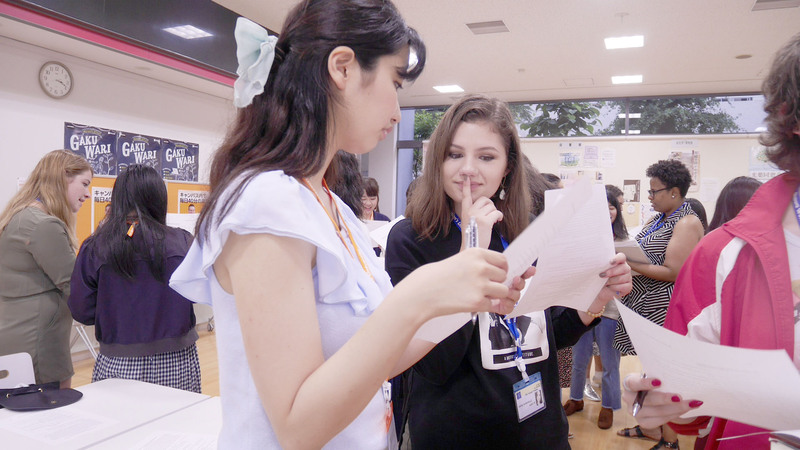 After lunch, international students and Showa students gathered together for the first of many cross-cultural workshops led by Audrey Morrell. 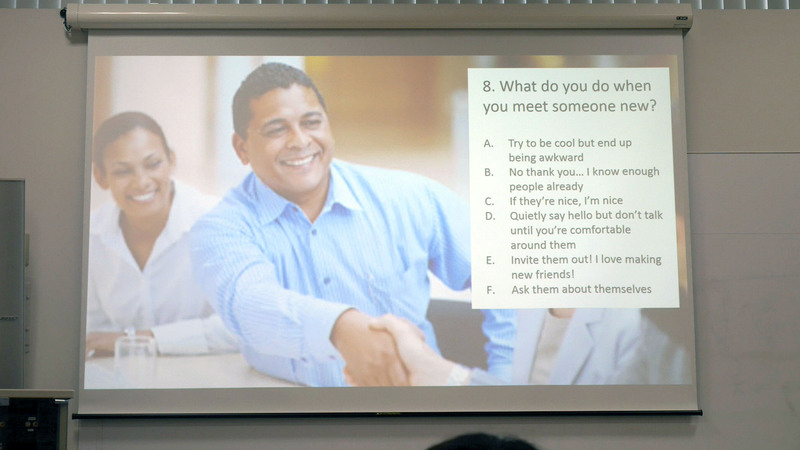 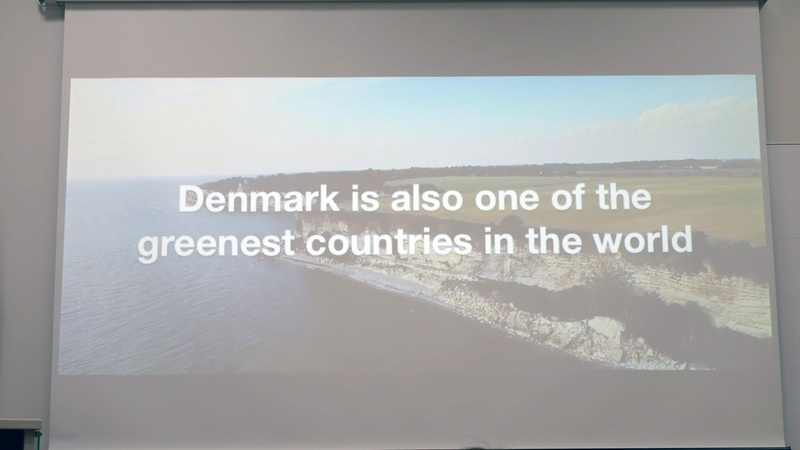 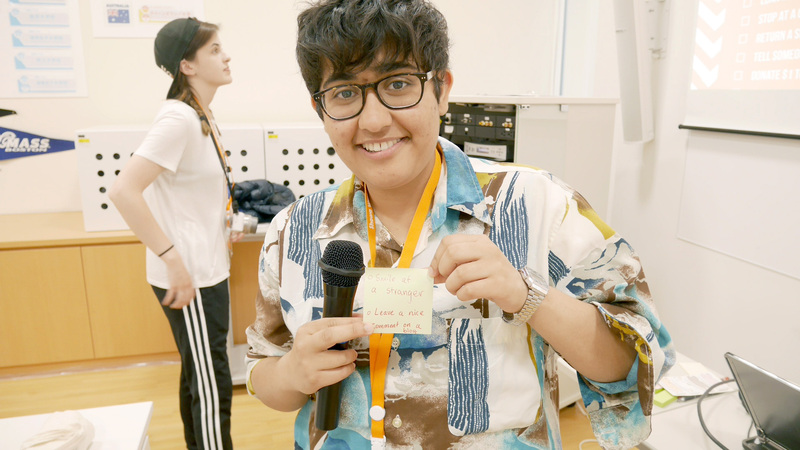 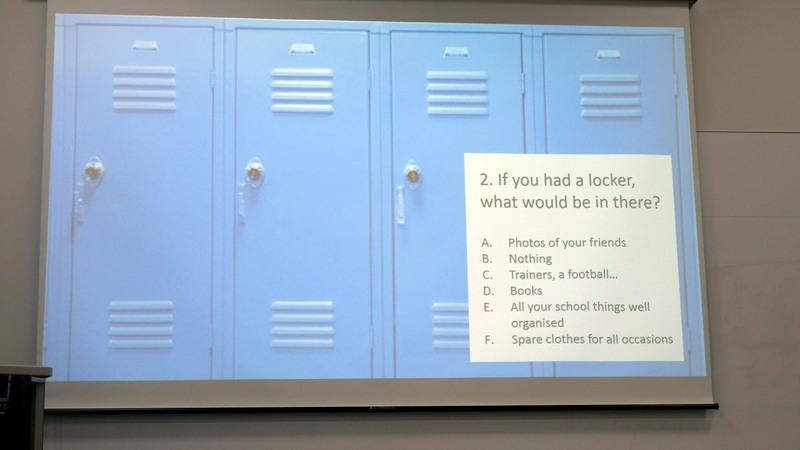 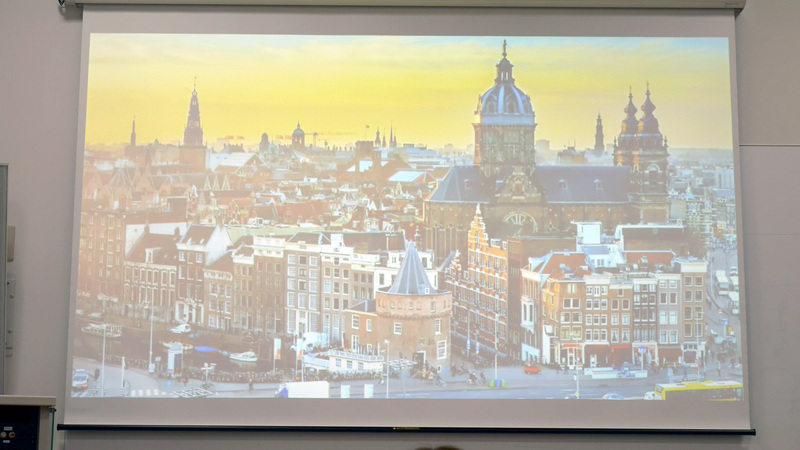 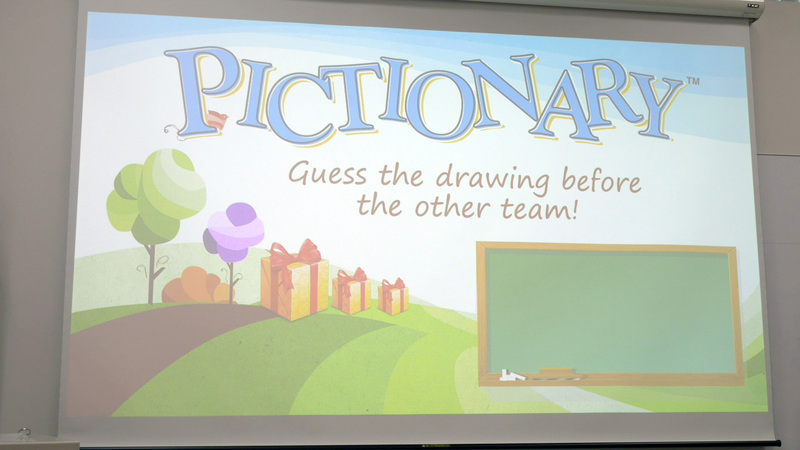 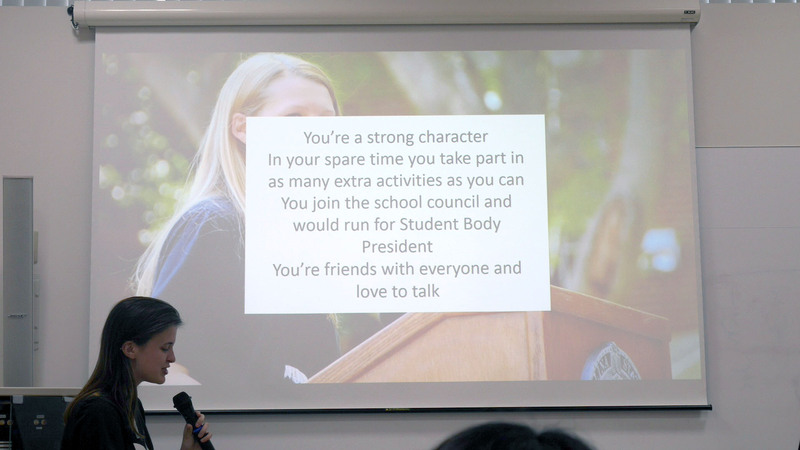 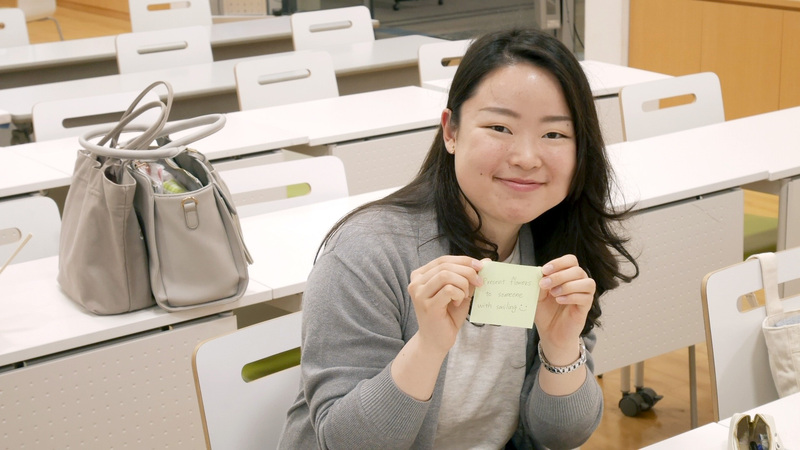 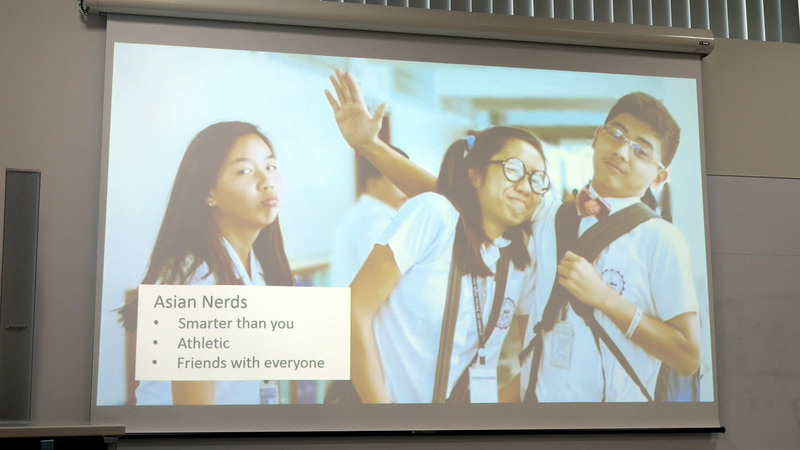 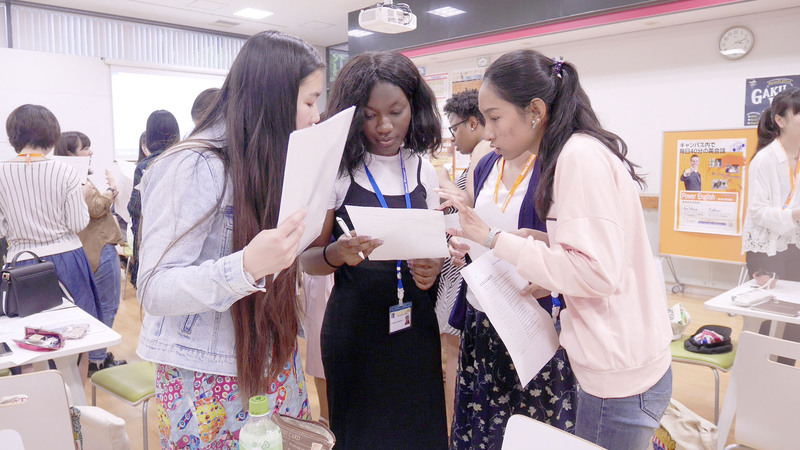 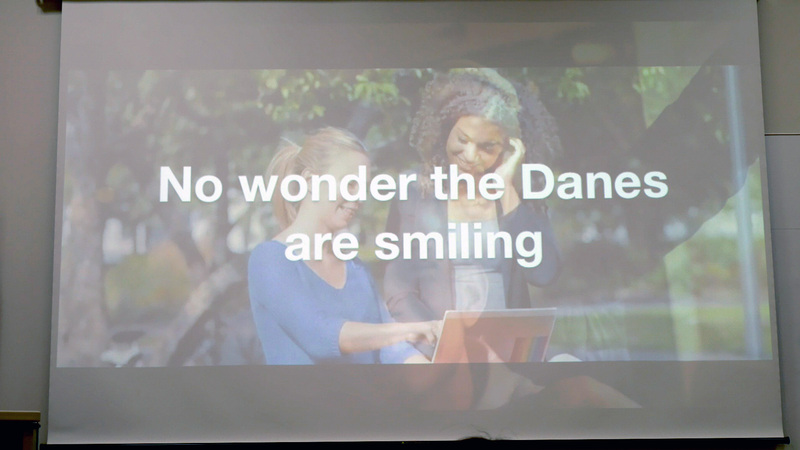 Students were introduced to each other, enjoyed icebreakers, and had meaningful conversation on the topic of culture and their individual experiences with their own and different cultures. 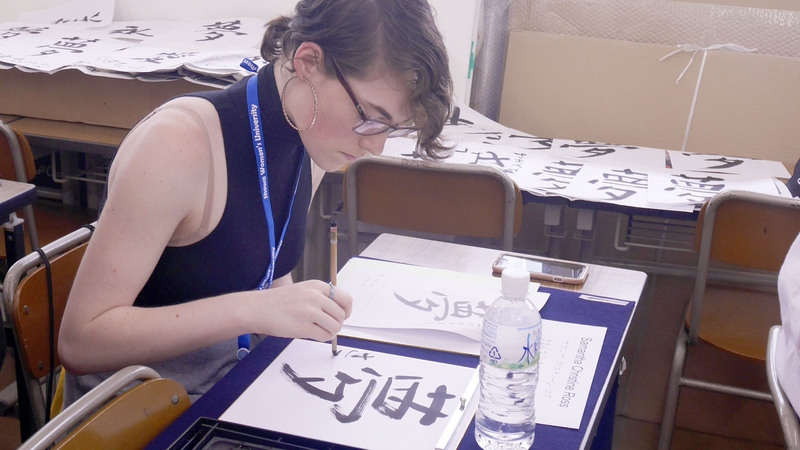 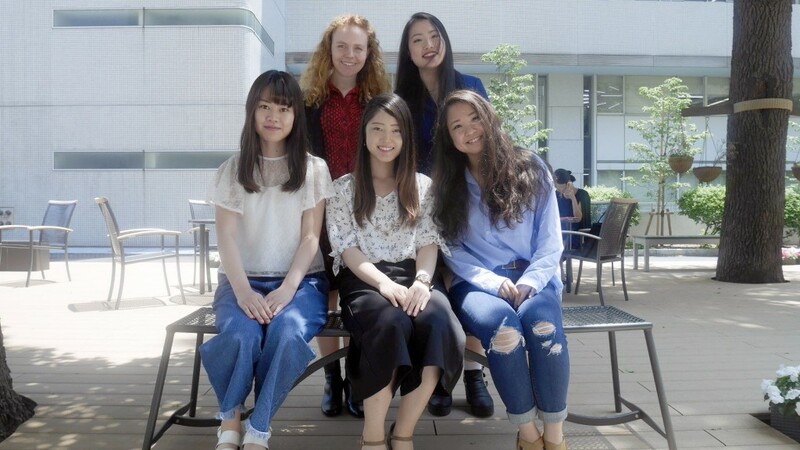 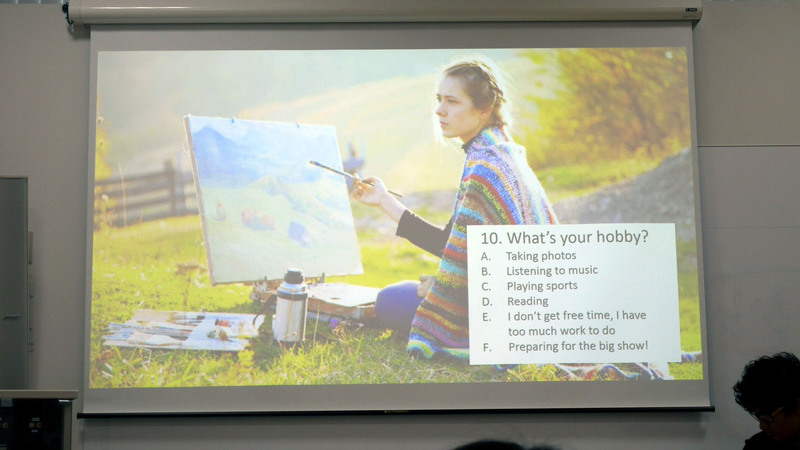 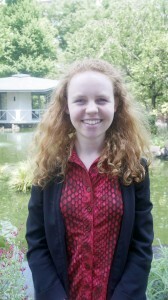 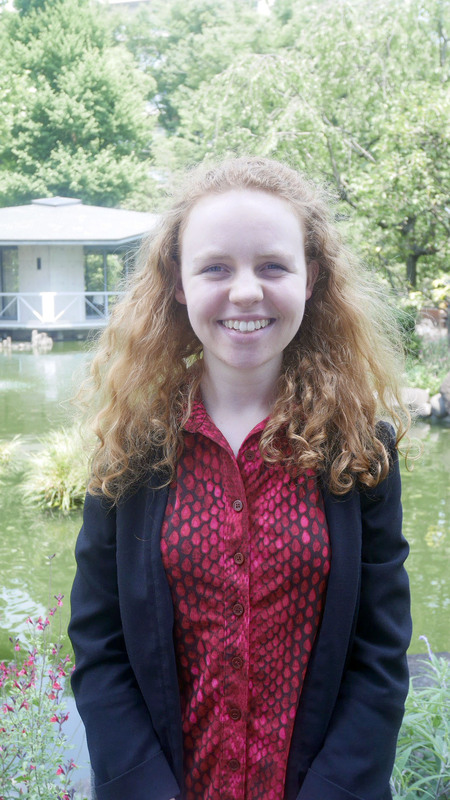 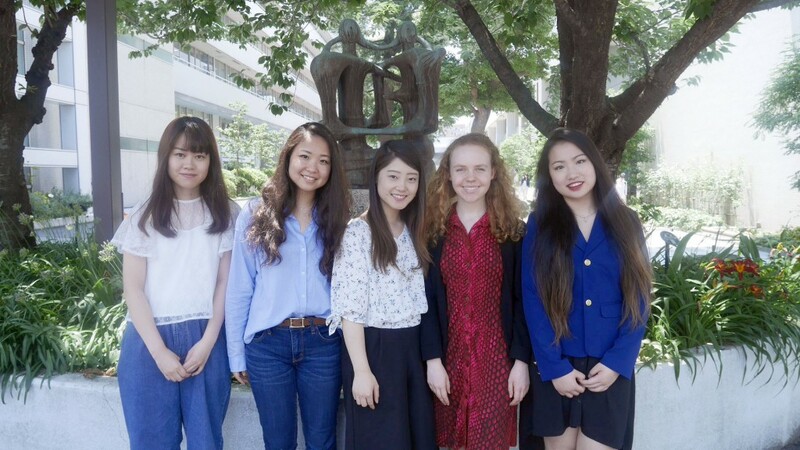 My name is Alice Donnellan, a rising sophomore from Harvard University, and I am so far thoroughly enjoying my first ever visit to Japan. 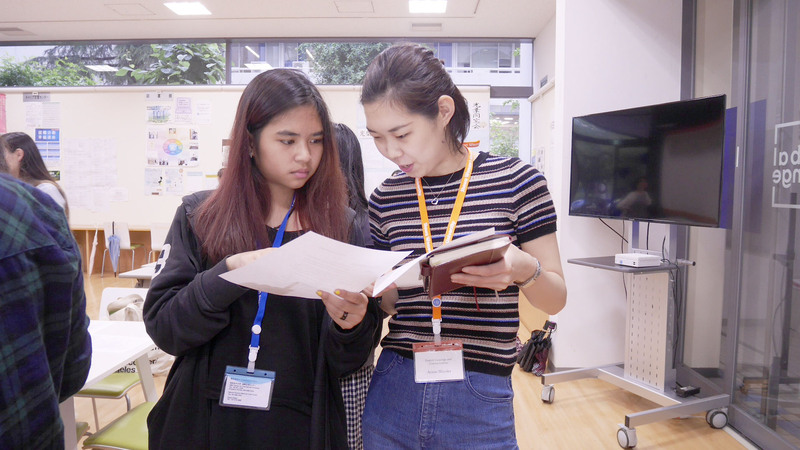 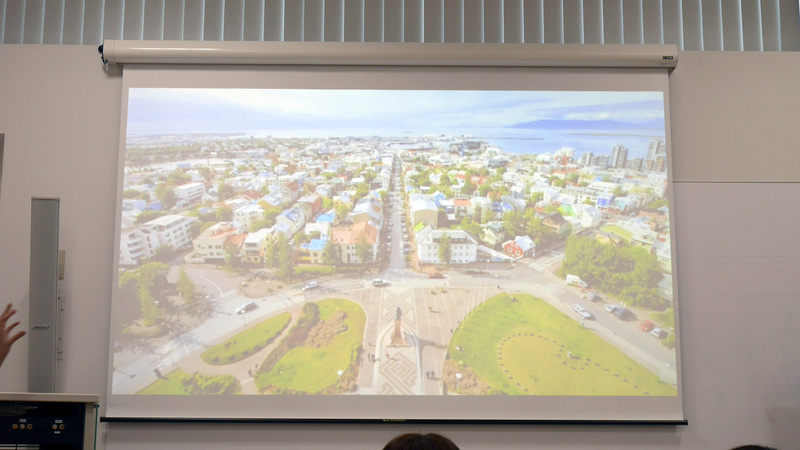 A prospective major in the Comparative Study of Religion, I have a special interest in the religions of the Far East as well as Japan’s culture. 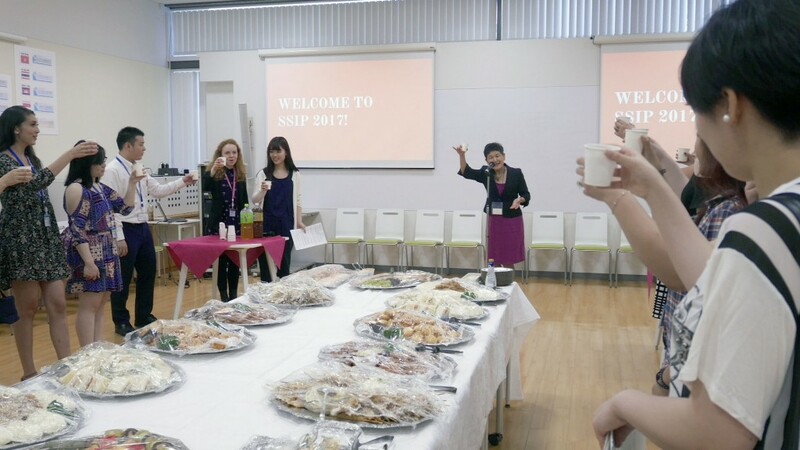 Interning for SSIP 2017 is giving me a valuable insight into a Japanese workplace whilst exposing me to the society and past of this fascinating country. 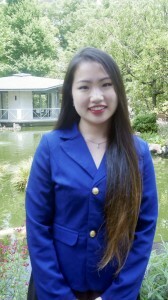 Hello everyone, my name is Amanda Yang. 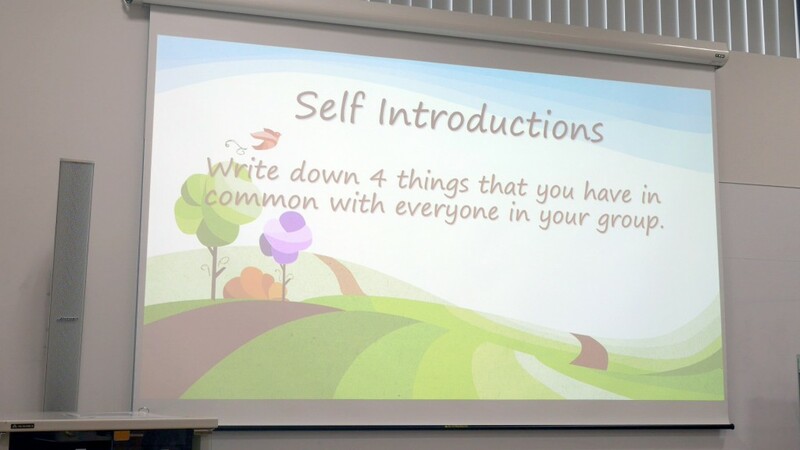 The first day of SSIP! 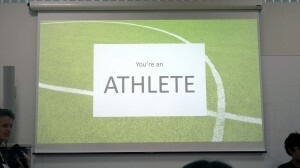 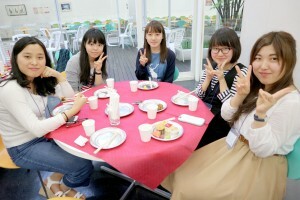 The interns brought the participants from the Olympics Center to Showa’s Global Lounge. 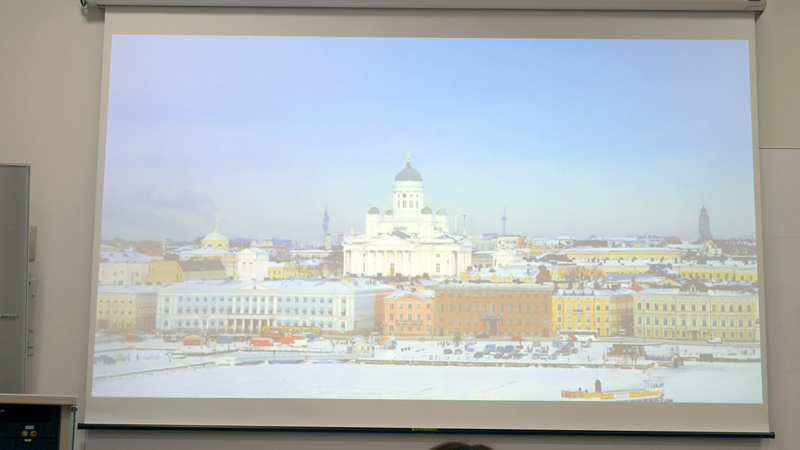 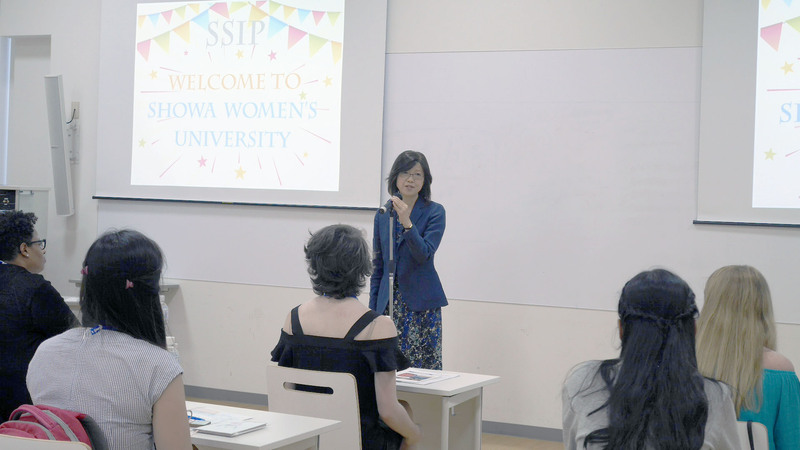 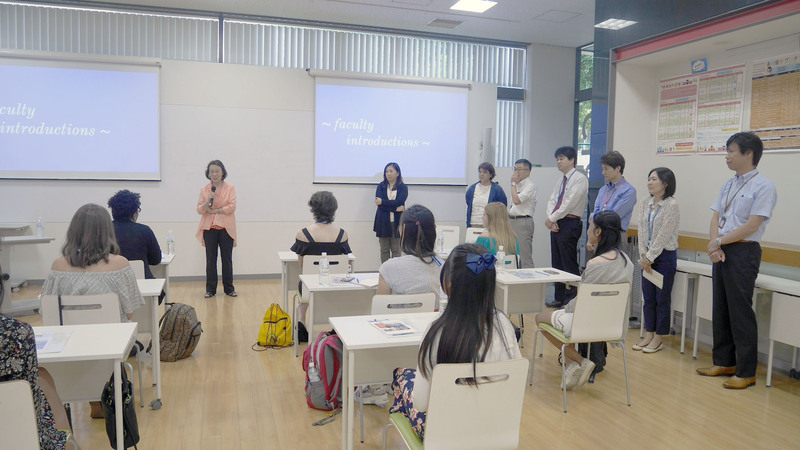 The day started with a welcome speech by Nishikawa-sensei, who organized the Japan Studies portion of the program and has been looking forward to the student’s arrival. 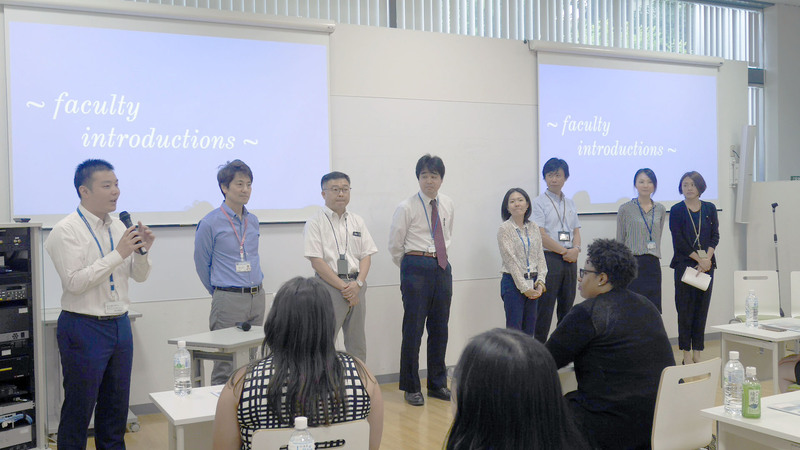 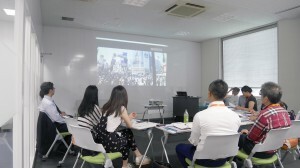 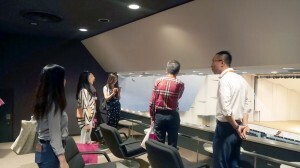 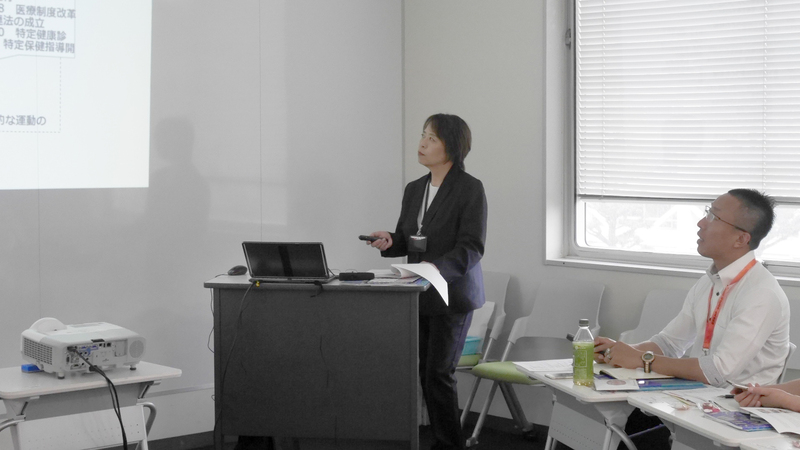 It was followed by a brief orientation on the program led by CIE’s Mitsuhiro Kurakata. 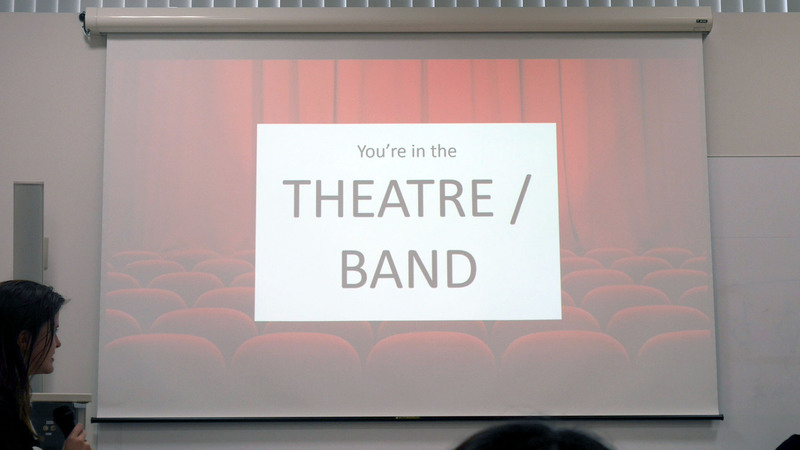 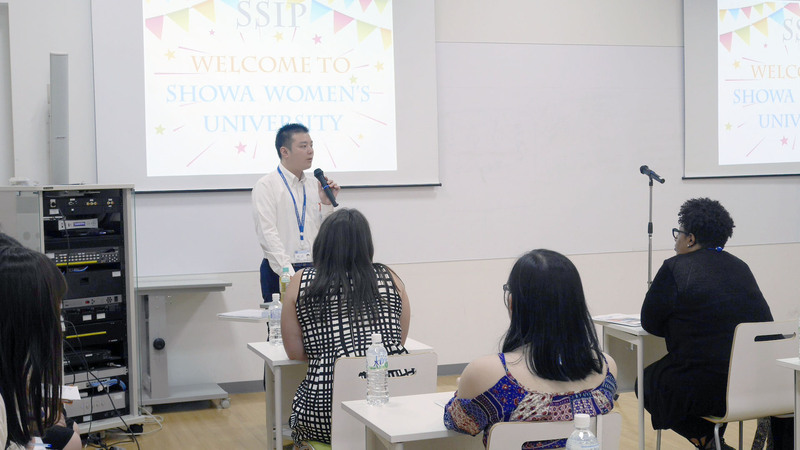 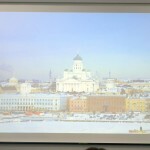 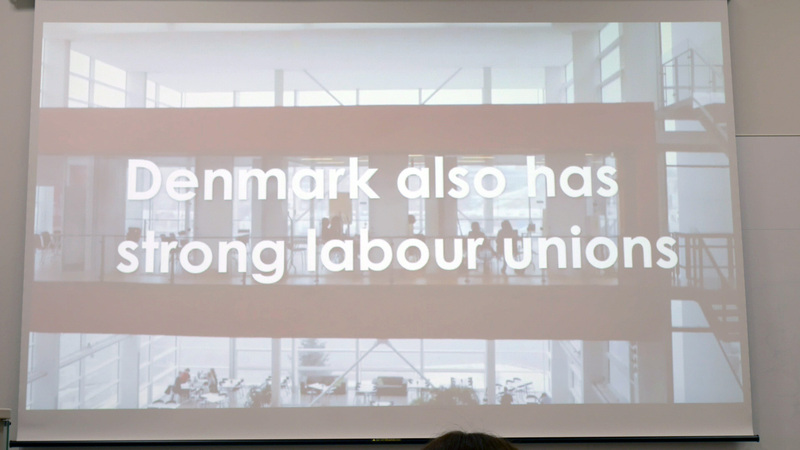 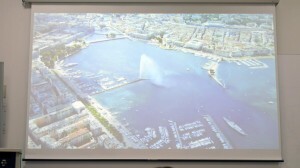 After a brief break, the Welcome Ceremony began with a warm speech from Showa University’s Chancellor Bando. 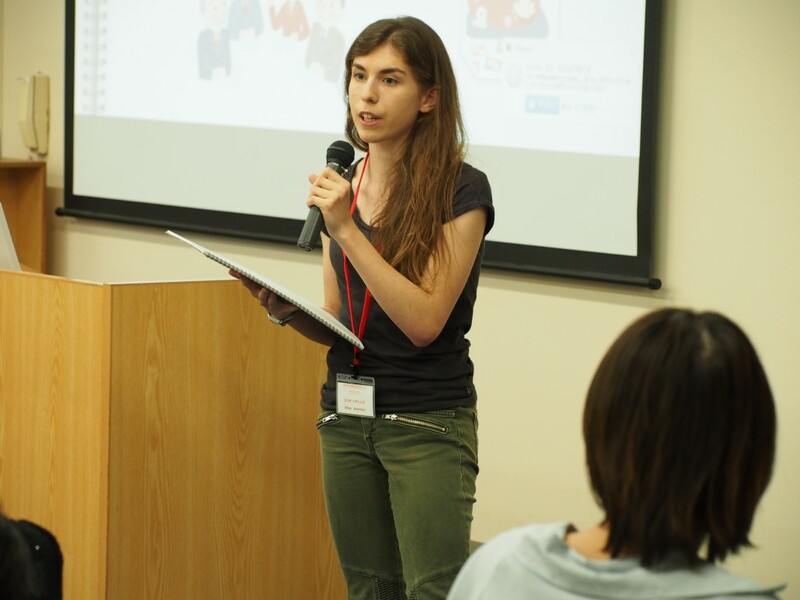 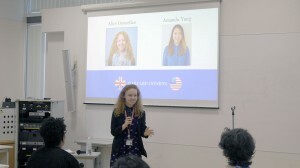 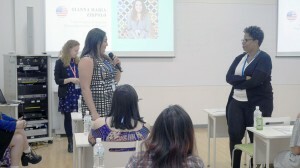 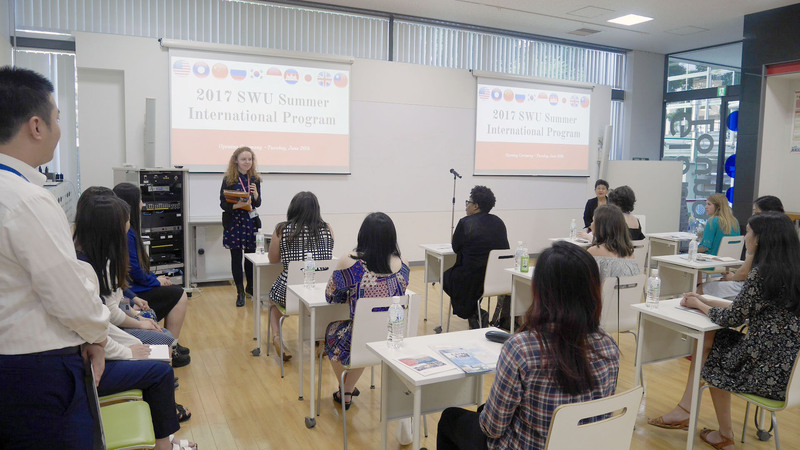 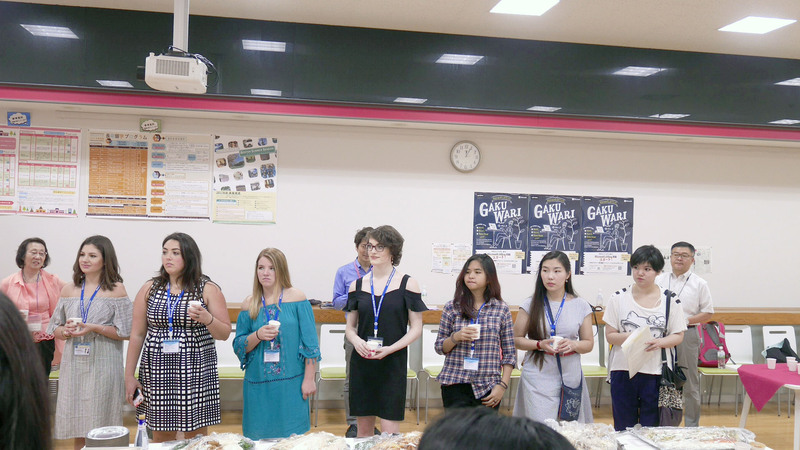 Throughout the ceremony, intern Alice Donnellan was a wonderful MC, introducing the participants, the interns, the Japanese participants, and the faculty and staff. 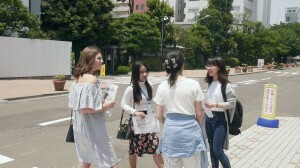 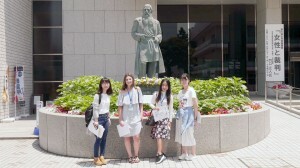 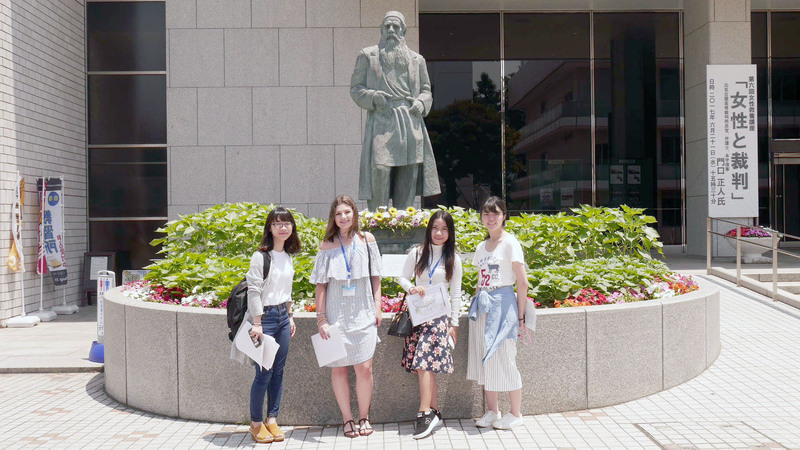 Luckily the weather was bright and sunny as the students split up into different groups to go on a campus tour led by Showa students. 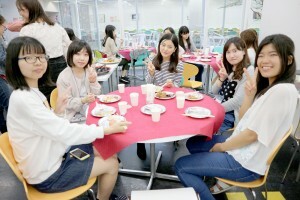 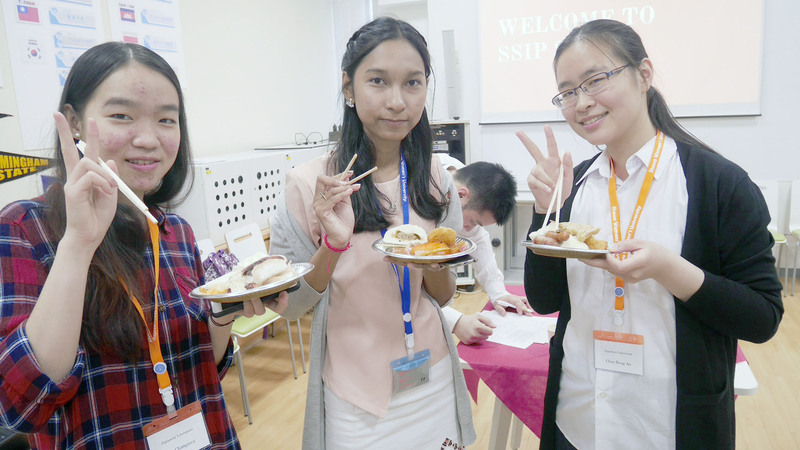 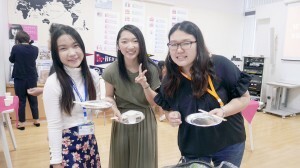 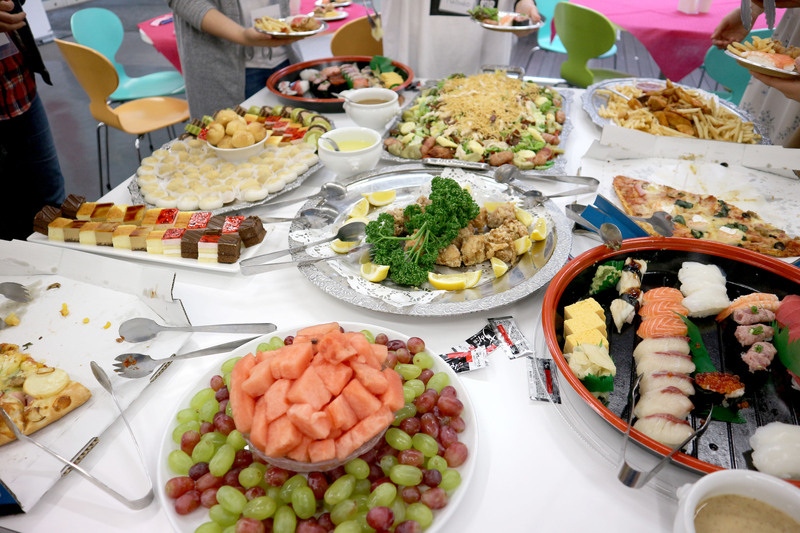 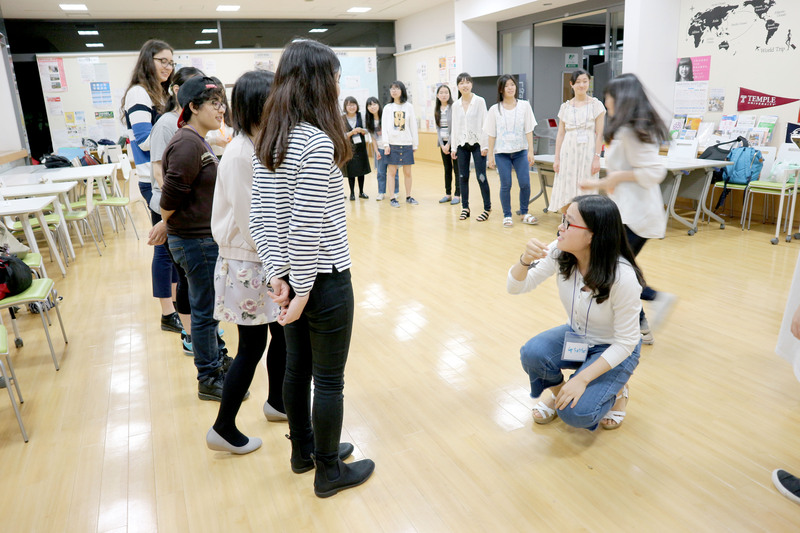 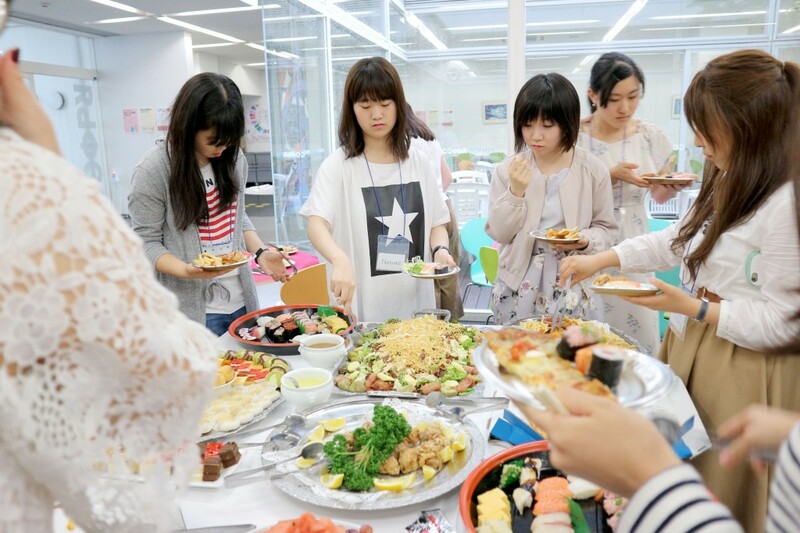 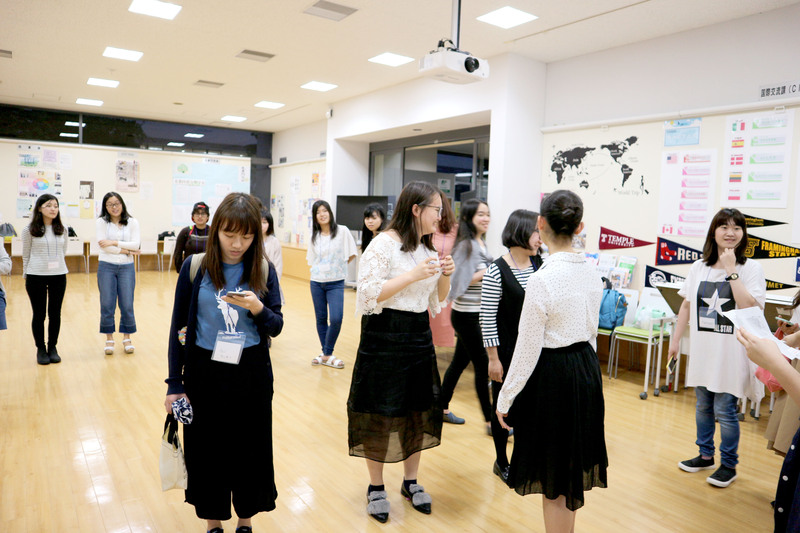 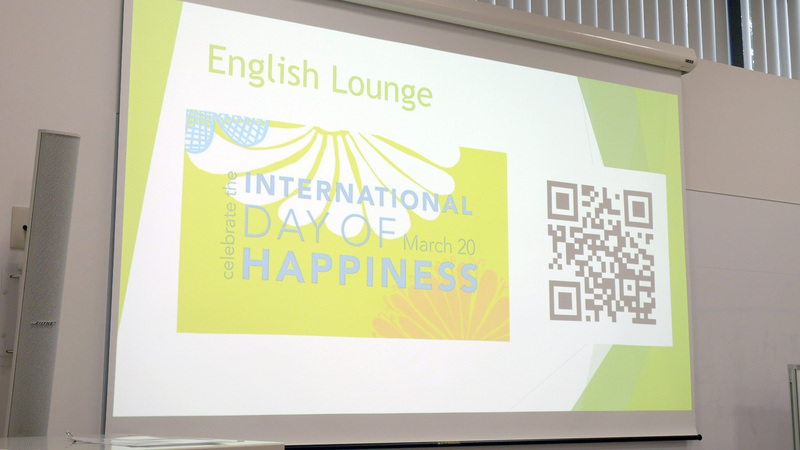 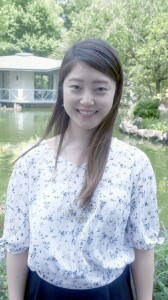 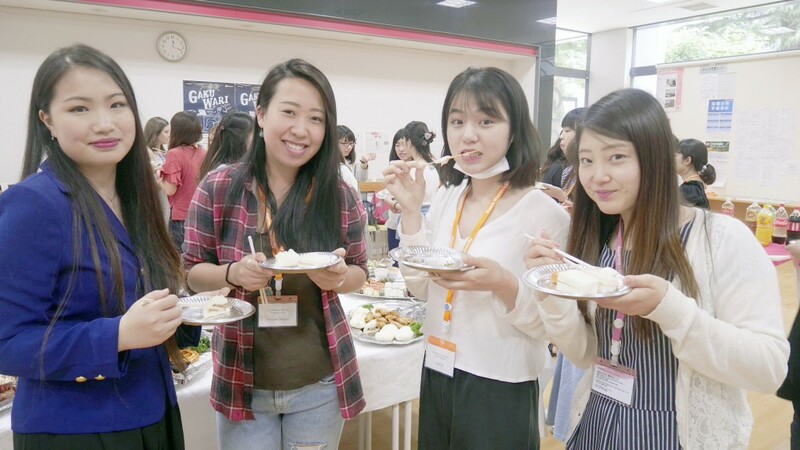 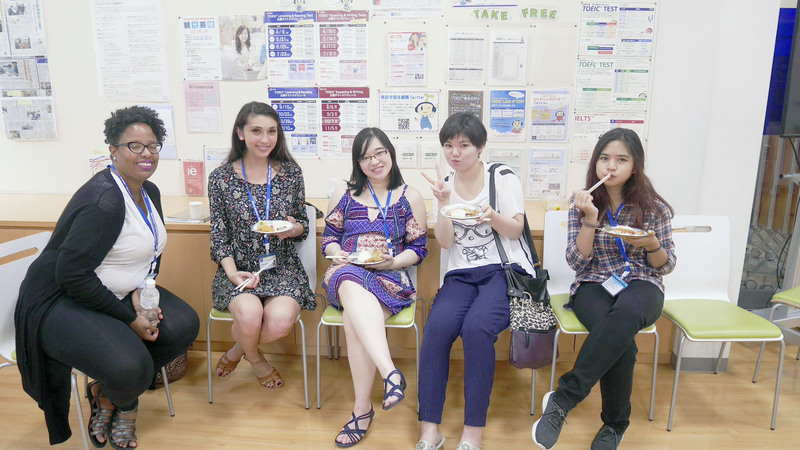 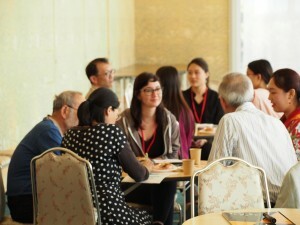 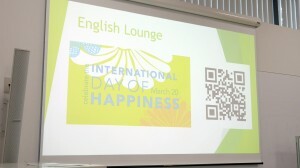 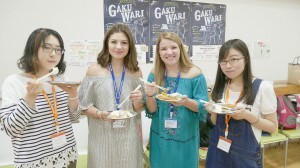 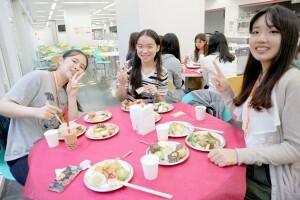 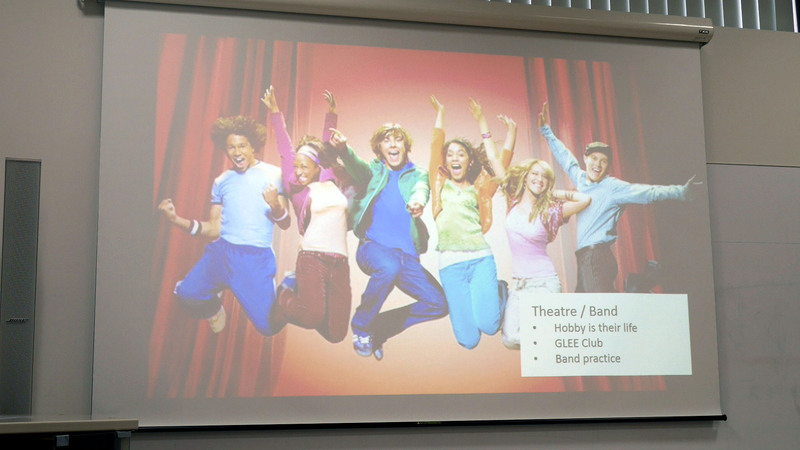 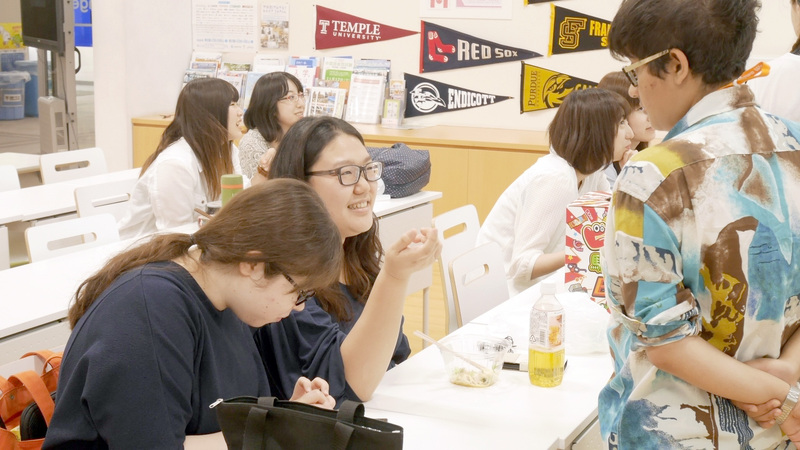 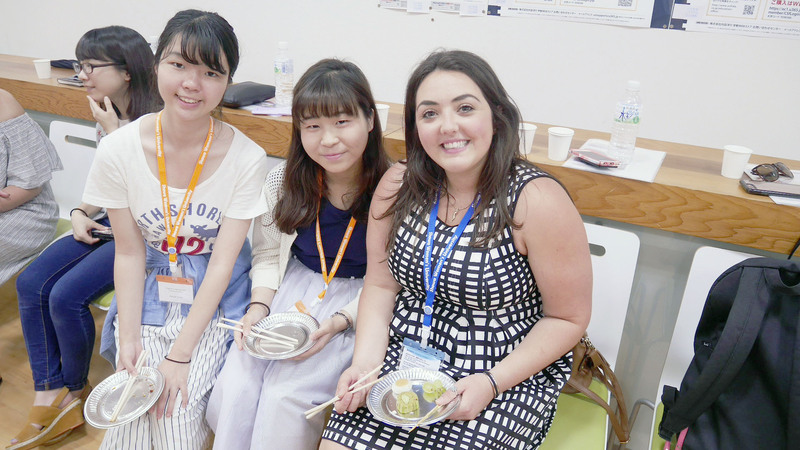 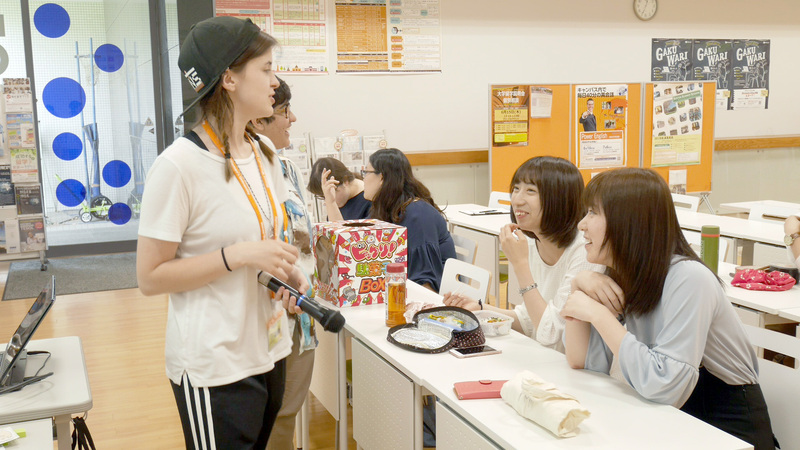 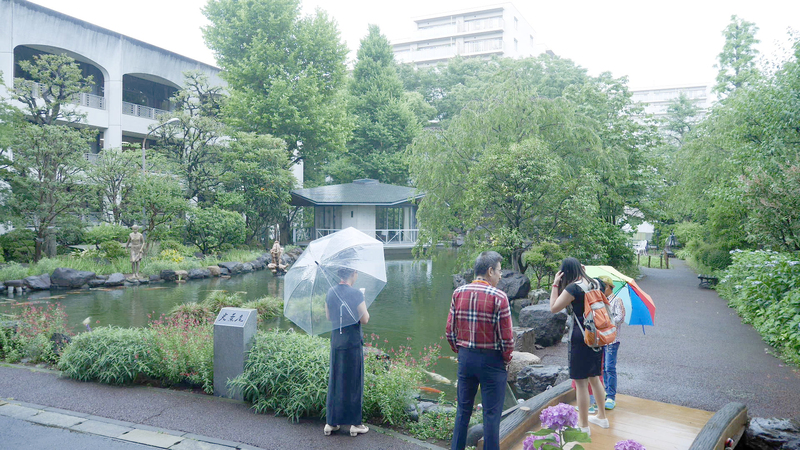 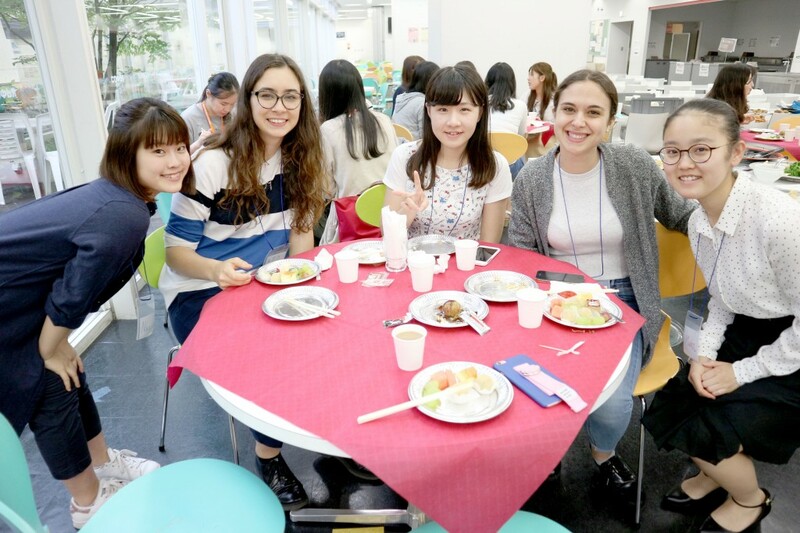 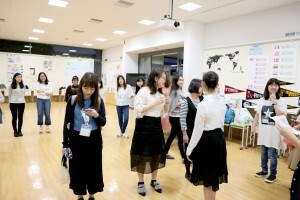 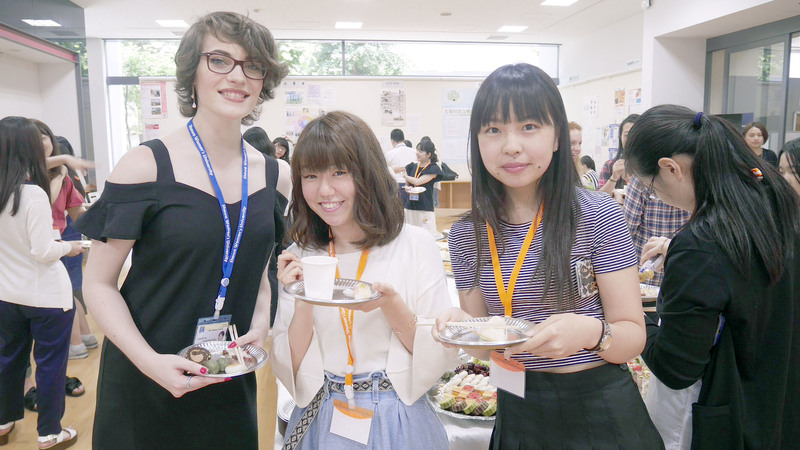 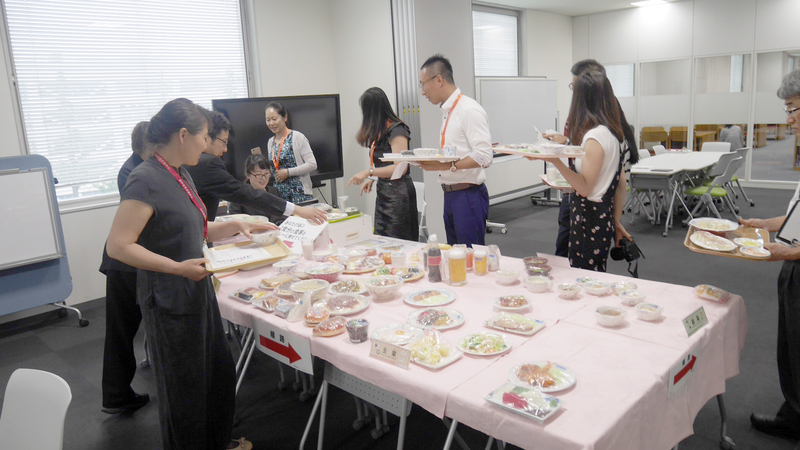 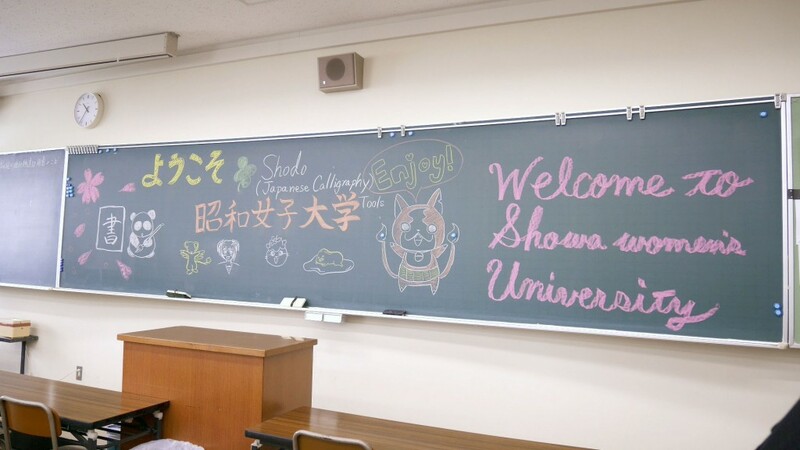 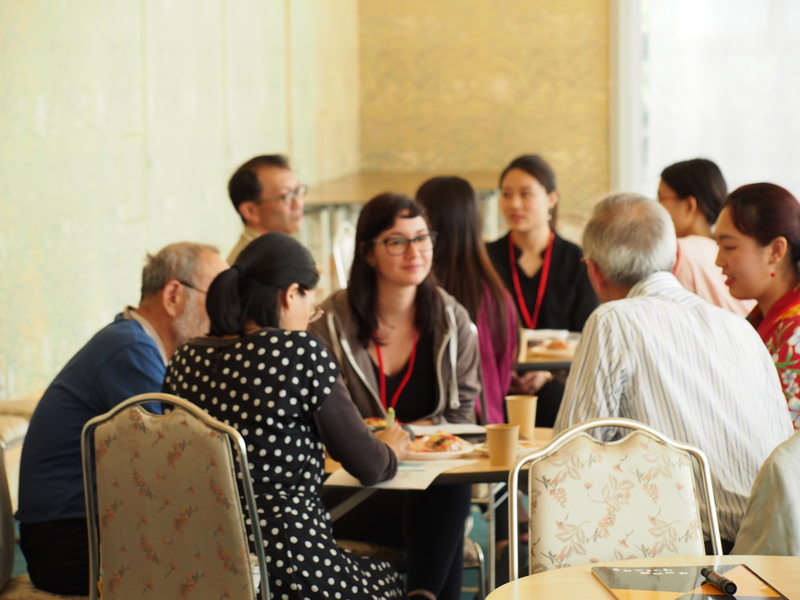 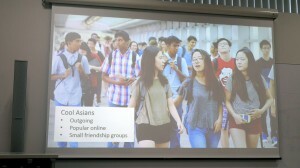 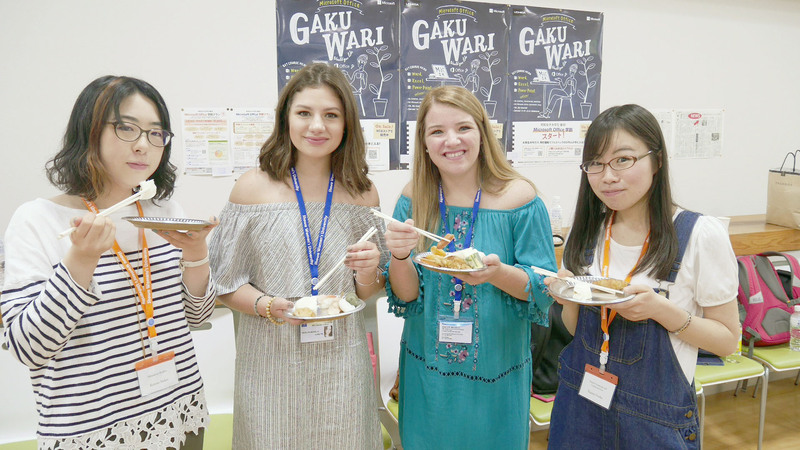 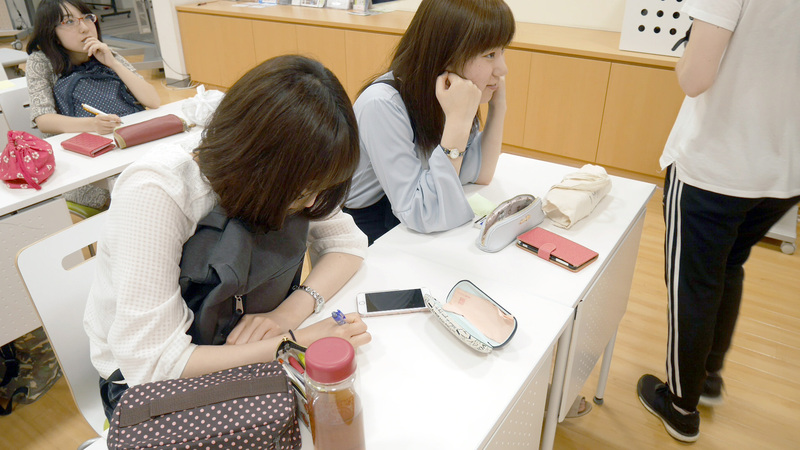 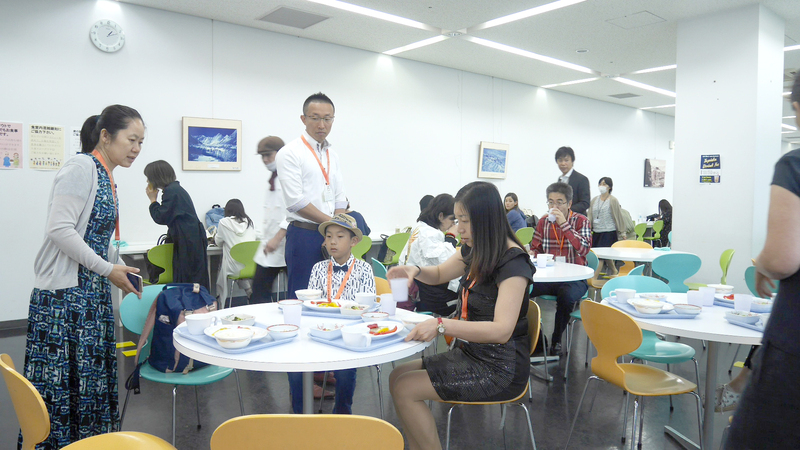 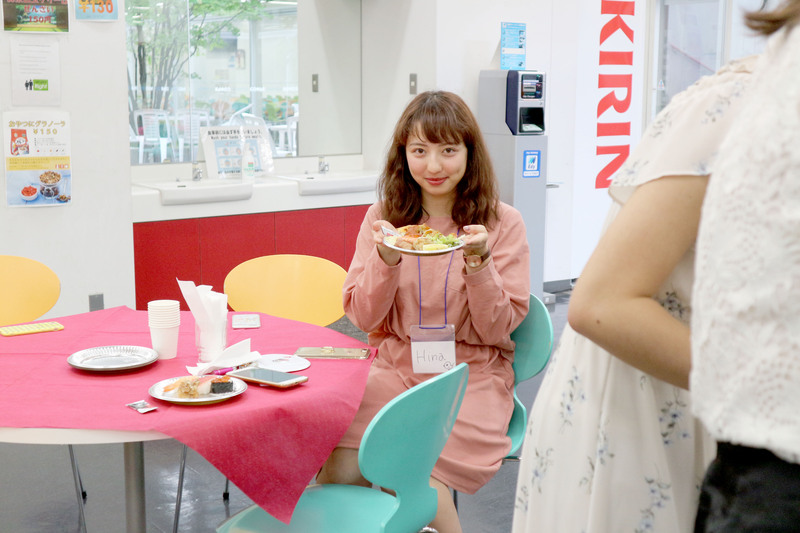 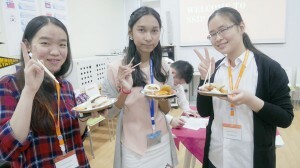 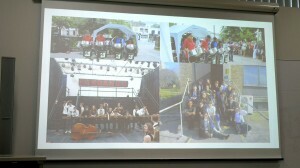 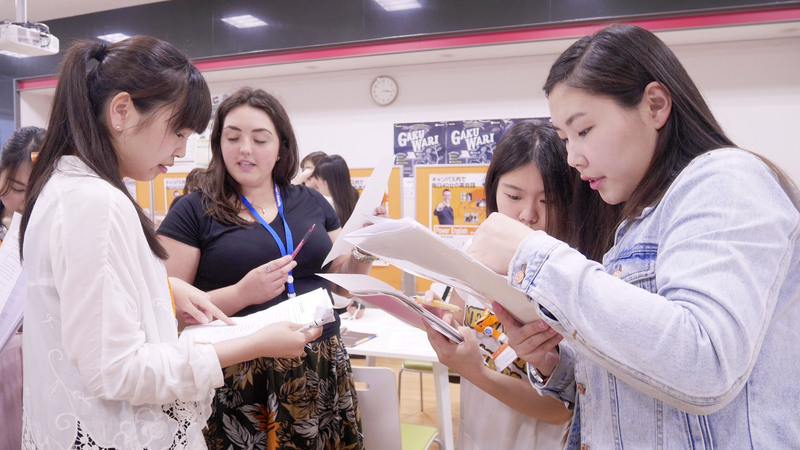 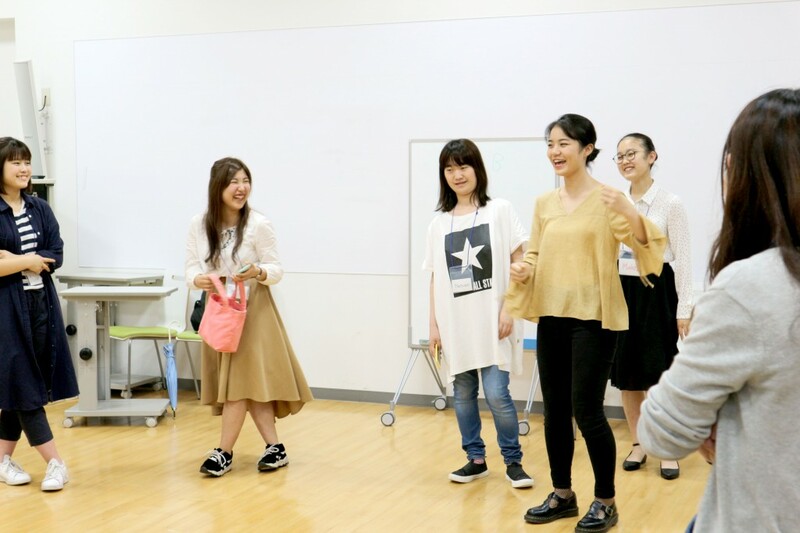 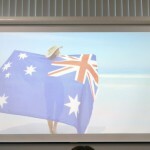 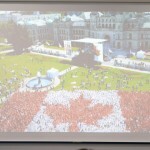 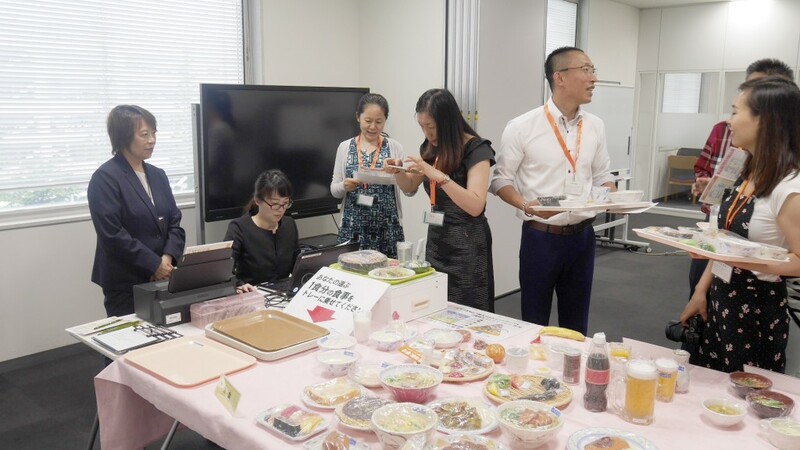 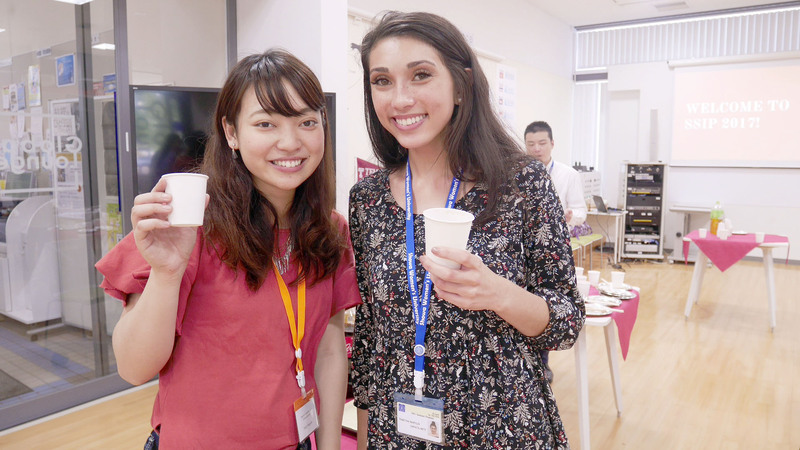 They returned to attend the welcoming party, also held in the Global Lounge, and were joined by many Showa students. 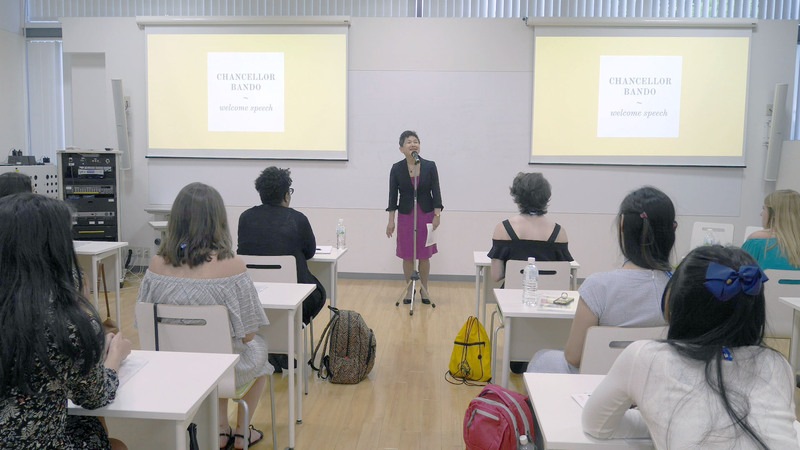 Intern Misaki Kadowaki acted as an MC for the welcoming party, first inviting Chancellor Bando to hold a toast to celebrate the start of the program. The toast was followed by good food and great conversation, only pausing for a rousing performance by the Showa Koto Club. 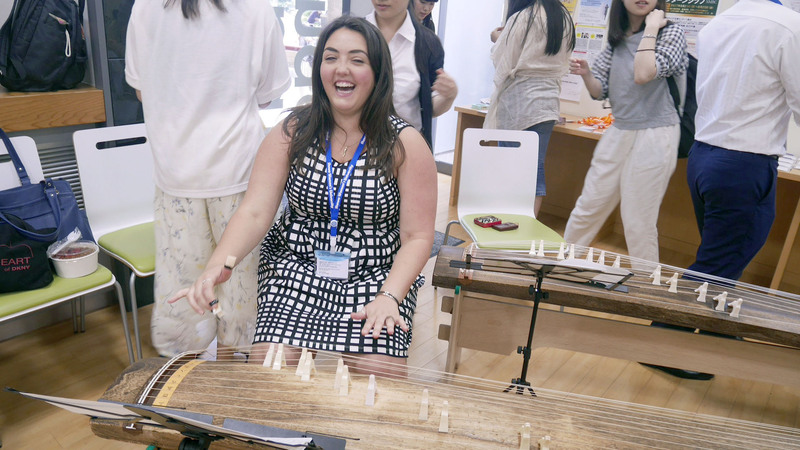 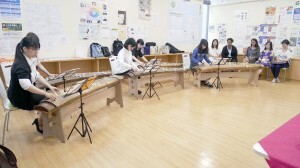 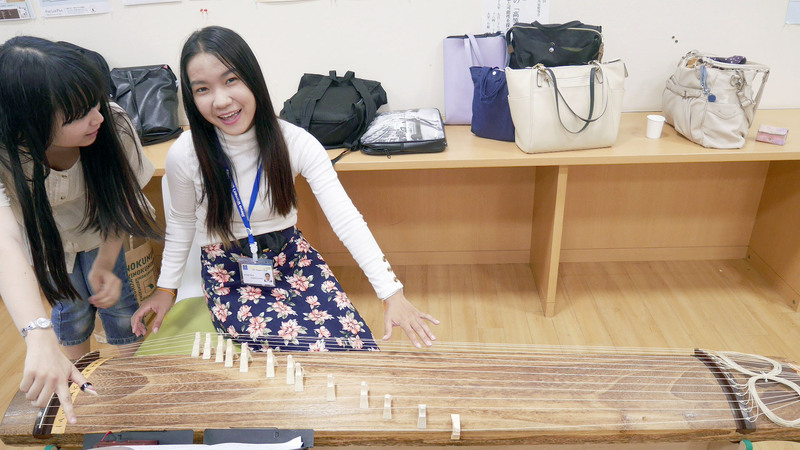 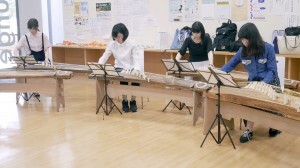 They performed the traditional Japanese tune “Sakura” and the ending theme from “Ponyo.” Students were then invited to try playing the koto themselves. 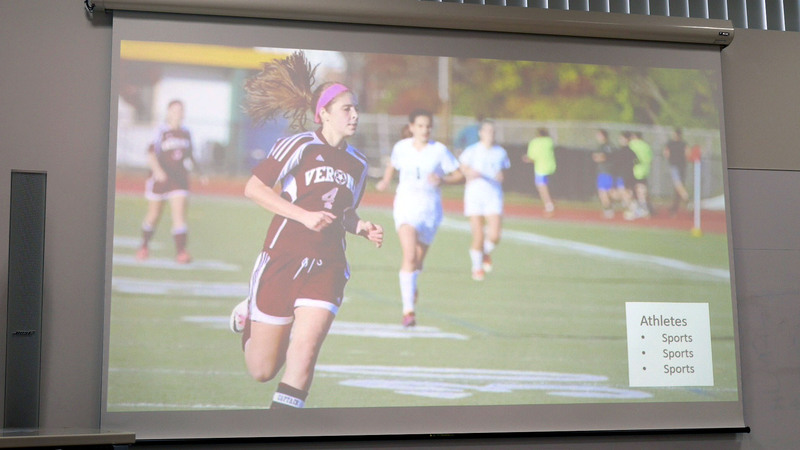 Everyone seemed to thoroughly enjoy themselves throughout the day, and it marked a great start to the program!